Aeronca (Now part of Magellan Aerospace) at Middletown, OH Airport (Hook Field) These photos were taken in June of 2009. 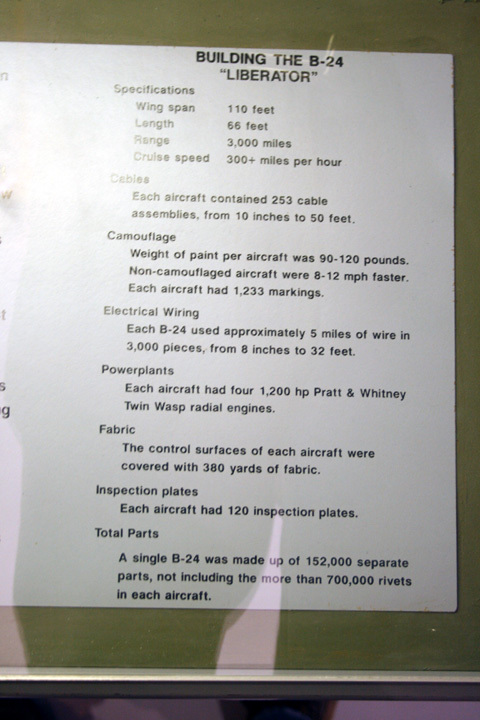 During WWII Aeronca manufactured at Hook Airport its own L-3 and the Fairchild PT-19 and PT-23 under license. 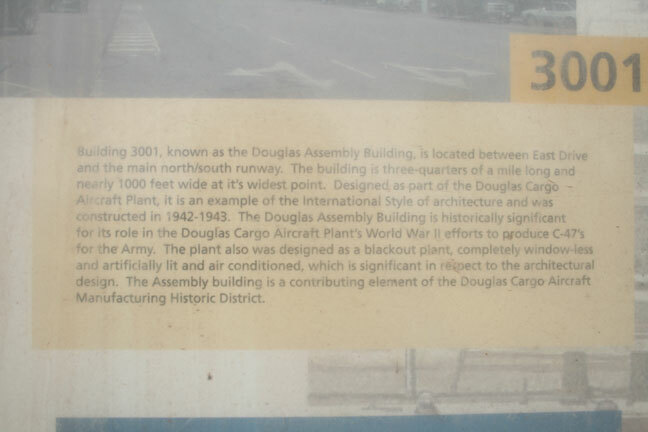 It does not appear that any of the original manufacturing plants still exist. 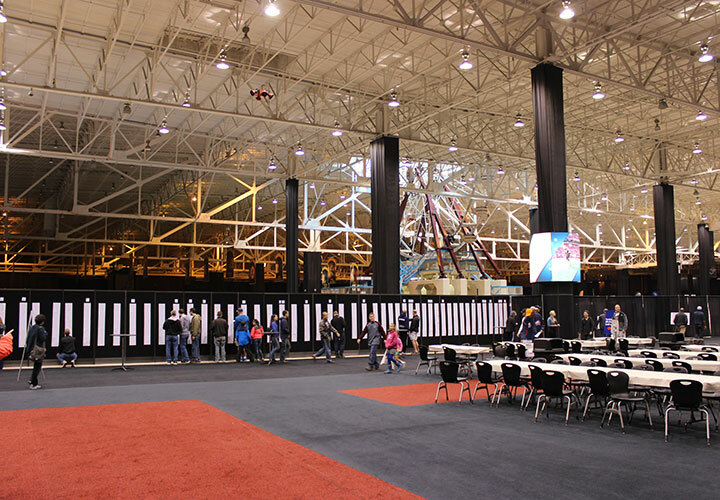 All of the facilities look to be new. 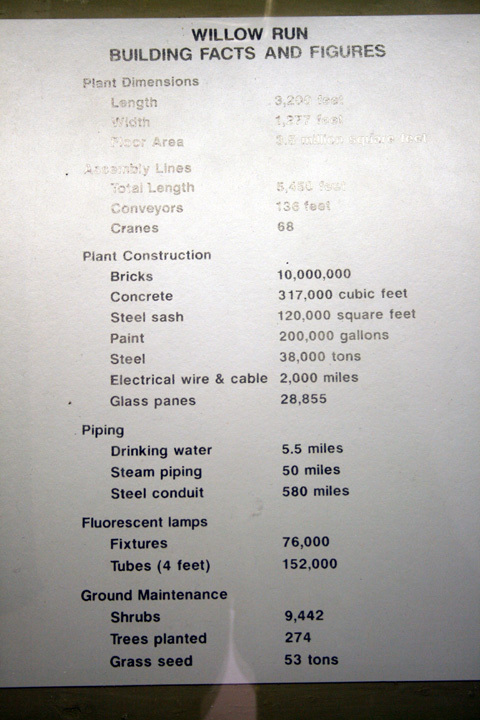 AeroProducts (Later utilized by Inland Division of GM, Then Delphi) at Vandalia, OH) - This plant was demolished in the spring and summer of 2008 and no longer exists. 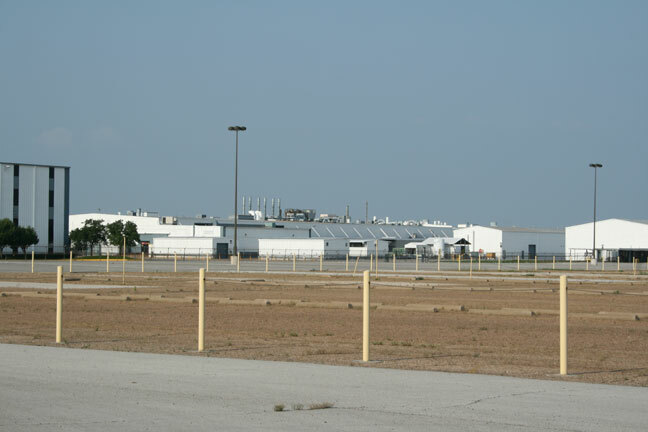 Beechcraft at Wichita, Kansas Plant 1. 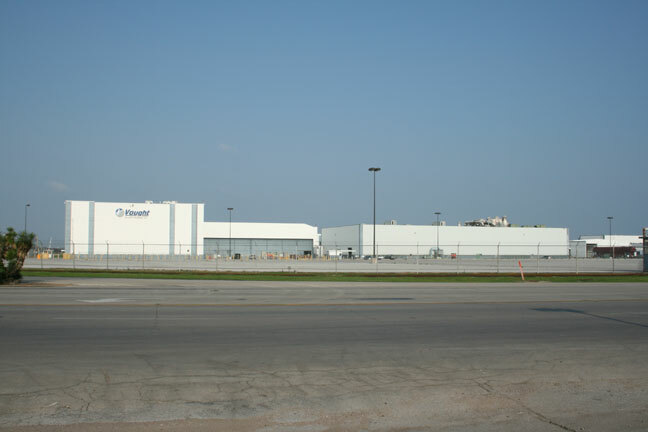 (Now Hawker Beechcraft) - Beechcraft had and still does have its headquarters, engineering and manufacturing at its own airfield on the east side of of Wichita, KS. 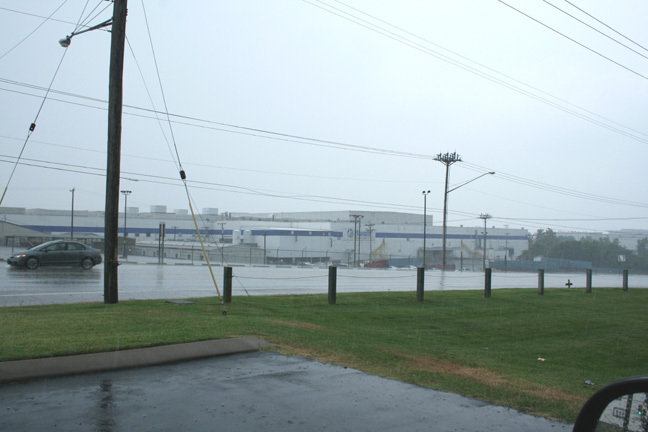 The photo below taken in the rain is a corner of its Plant 1 which would have been the center of its operation during WWII. 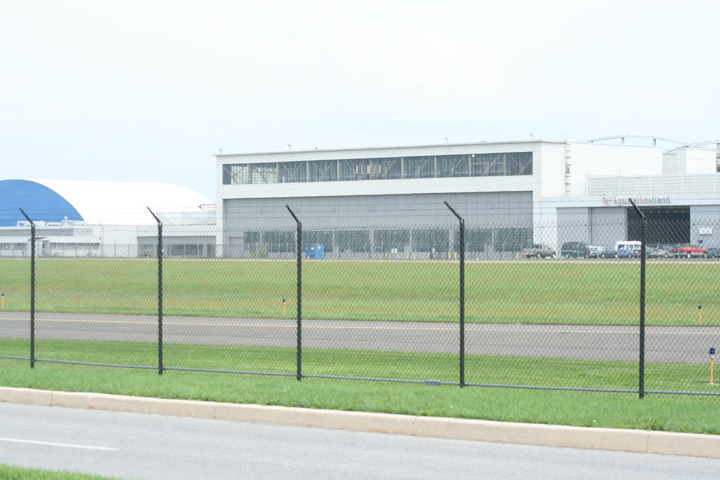 Now the Hawker Beechcraft operation is on all four sides of the airport. Bell at Marietta, GA B-29 Plant (Lockheed since 1951) Air Force Plant #6 - This plant built at total of 668 B-29s during WWII. 357 B-29s (One reference indicates these were B-29As. 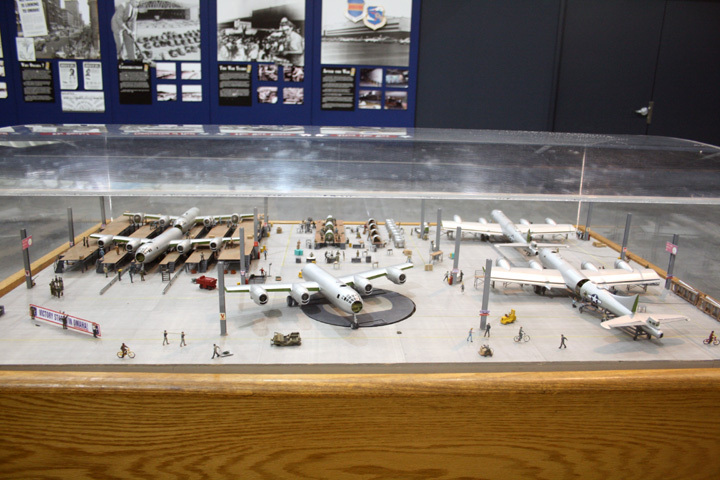 However, the B-29A was only built at Boeing Renton, WA. See Below.) and 311 B-29Bs. Marietta was the only plant that built the B model, which was stripped of turrets, guns and armor except for the tail position and were optimized for low level night bombing and were 7,0000 pounds lighter and ten miles an hour faster than the normal B-29. 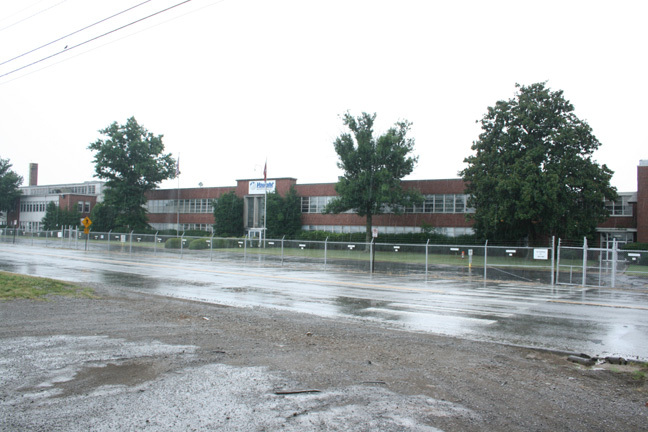 Looking south at the Plant from Cobb Street. Bell at Wheatfield, NY P-39 and P-63 Plant - This 600,000 square foot aircraft manufacturing plant was built on the site of the current Niagara Falls, NY Airport in 1941 produced the bulk of the P-39s and all of the P-63s, along with the post war jet aircraft, rockets, and helicopters. In 1951 the helicopter division moved to Ft. Worth, TX. 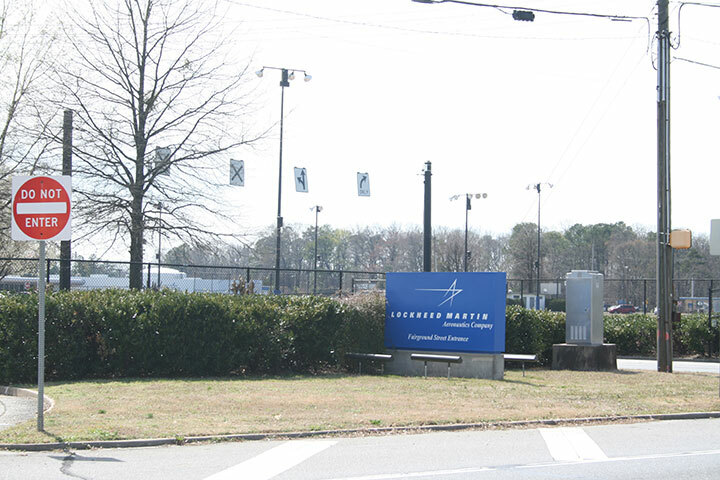 Today what is known to the local residents as the former Bell Aerospace Building is occupied by Lockheed Martin Maritime Systems and Sensors. This appears to be a continuation of work Bell did on hovercrafts did in the 1960's. Several other companies are also utilizing some of the space, while some parts of the plant are falling down. 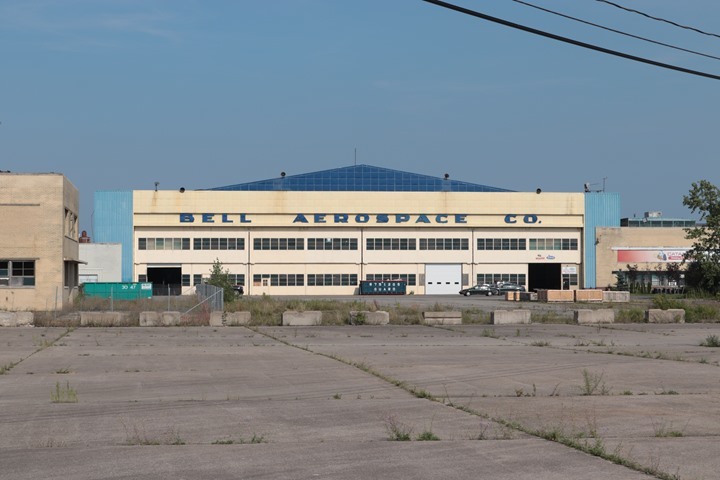 Bell Aerospace Company doesn't exist anymore but the name still remains on the building. Boeing at Renton, Washington B-29 Plant - This plant was originally built by the Navy to build Boeing XPBB-1 Sea Ranger seaplanes. However, by the time the plant was built the Navy realized the true value of aircraft carriers and land based aircraft like the B-24 for patrol, and only one Sea Ranger was built, which became known as the Lone Ranger. The Sea Rangers would have come out the plant doors and then been launched down ramps into the lake. 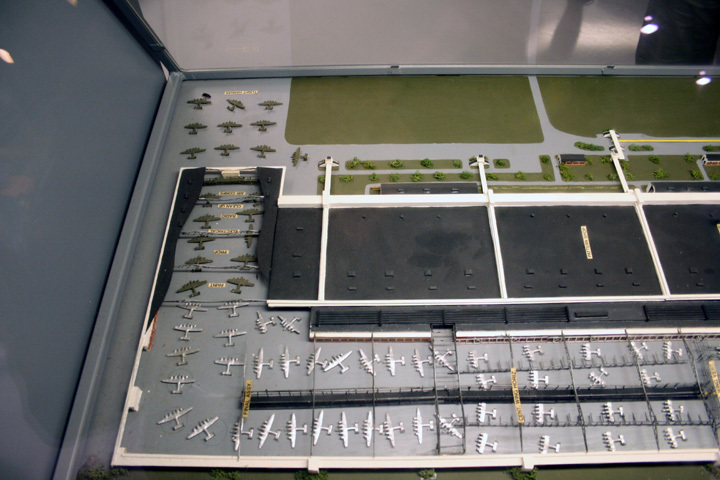 With the Navy not needing the Sea Ranger the Army took over the plant for much needed B-29 production. (The Renton B-29s were actually B-29A models due to the fact that their wings were attached differently to the aircraft than the ones built at Wichita, Omaha, and Marietta. Due to this they had one less fuel cell and had a shorter range than the others.) The world's only flying B-29, "Fifi", operated by the Commemorative Air Force was built here and came out these doors. 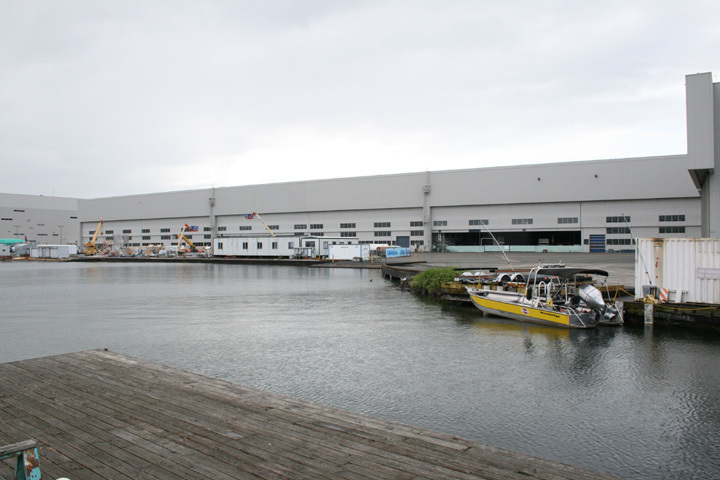 There is now a fishing and boat launch dock out in front of the plant today. This is where I took the first four photos in this series. 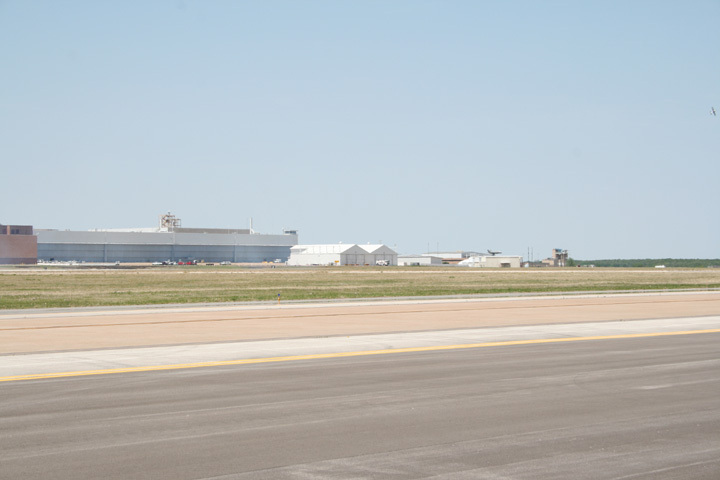 The Plant behind the 737 on the left was not part of the original construction and with its higher bay I would have to assume is the final assembly point for the 737. 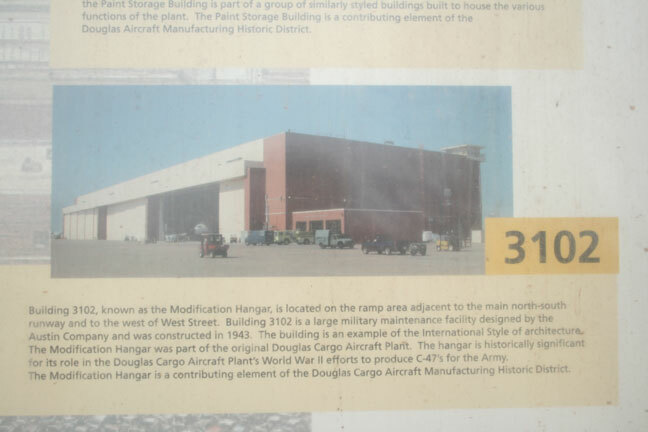 This was the original paint hangar as about the first fifty B-29As were painted a dark green camouflage. Note the circular concrete pad in the lower right corner. This leads to a bridge that crosses the Cedar River to get to the runway. 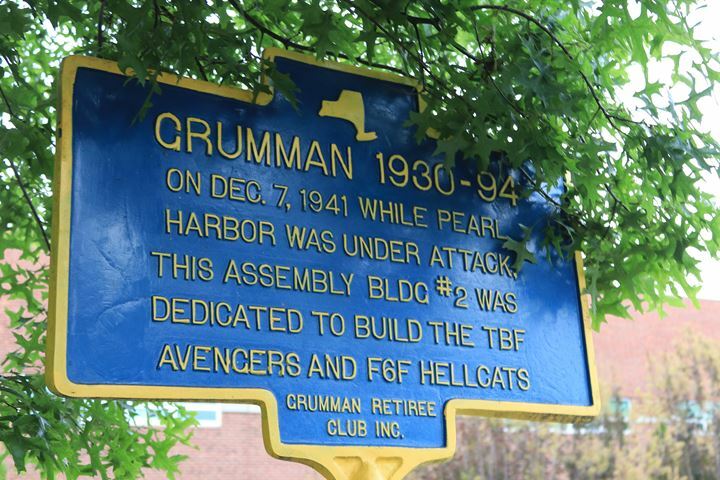 However, the bridge was not there when first B-29s were completed resulting in the early B-29As to be barged a couple of hundred yards from the plant to the airport. 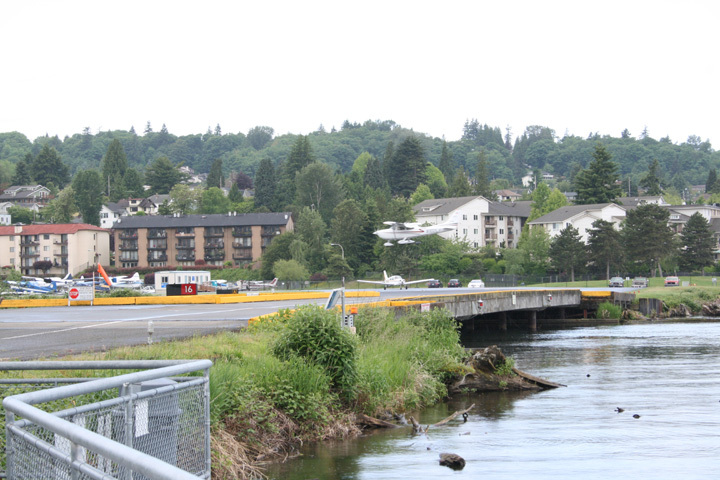 A seaplane ramp can be seen in the this photo. The three that were originally constructed still exist. 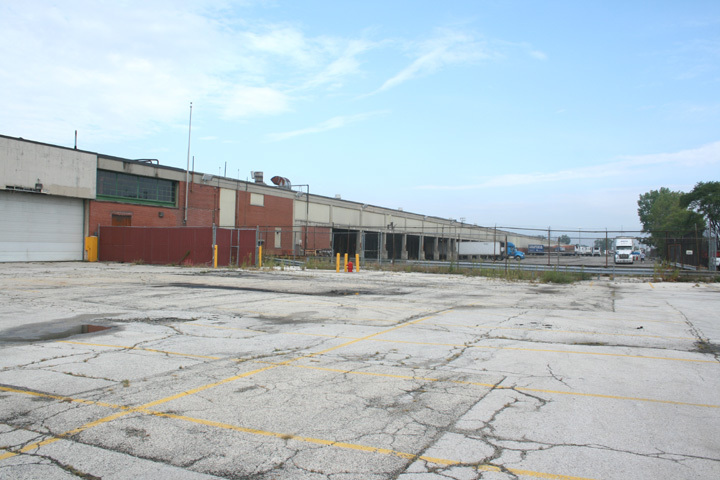 Today there is a municipal park squeezed in between the west side of the plant and the east side of the river. One can park there and walk out to the dock. 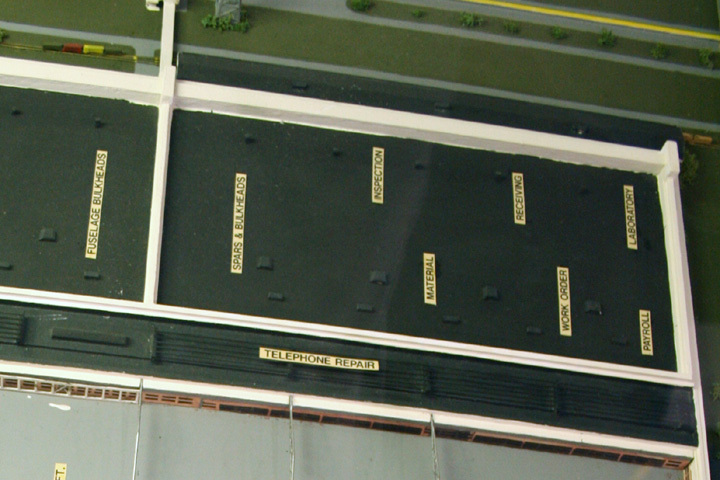 Another of the ramps can be seen here. 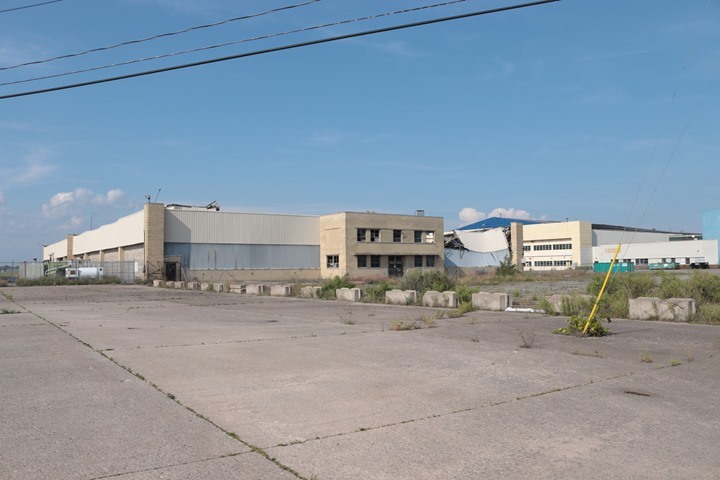 After WWII when production of B-29s had ceased this ramp area that is now filled with construction equipment was filled with surplus Martin PBM Mariners that the Navy stored on the ramp and inside the plant. 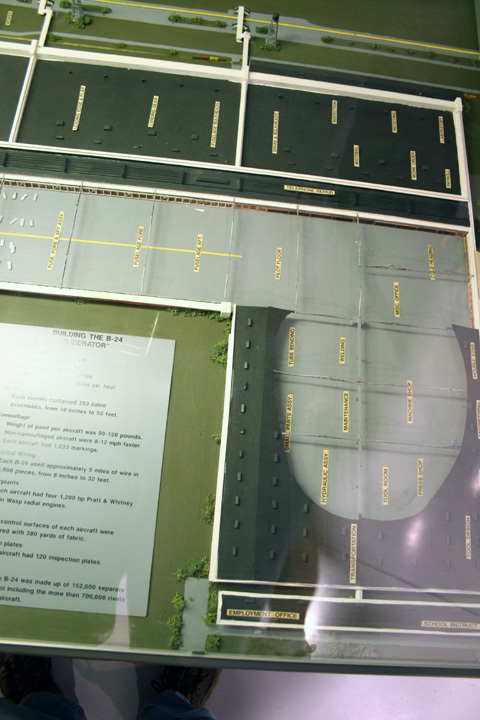 In 1947-1949 24 Mariners were stored on this ramp. This is the second bridge that was built 30 years ago across the Cedar River over to the runway that in WWII was used exclusively for launching B-29A's. This is a permanent structure whereas the original built during WWII was a pontoon bridge that could be removed to allow for boats to navigate in and out of the Cedar River. Permanent may be somewhat the wrong term as the bridge pictured here is going to be replaced by a new one in the 2013-2014 time frame. On December 30, 1943 the B-29A '"Renton Girl" was the first Superfortress to take off from the newly extended runway which had not yet been paved. 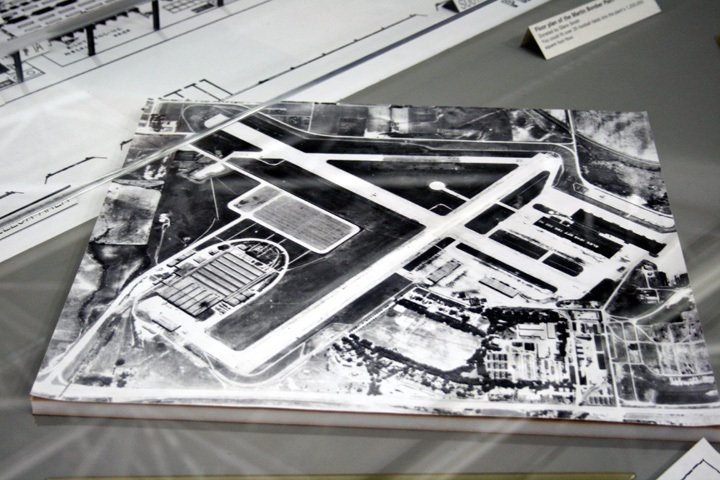 The original Bryn Mawr airport at this location was small grass field that was established in 1922. The park trail to the dock, which can be seen in the left side of this photo, takes one past two gates. 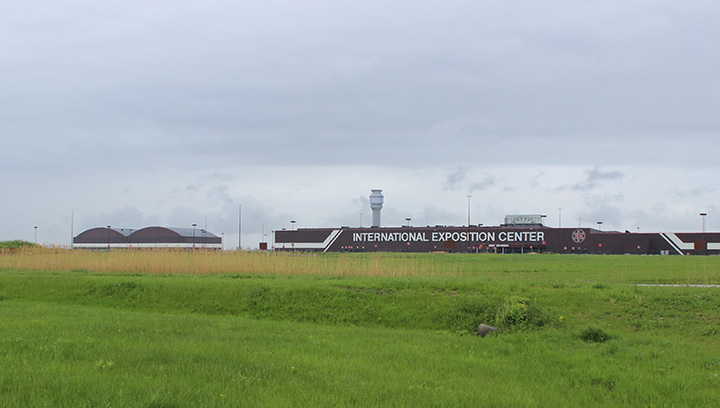 One opens to Boeing on the east and the airport on the west. 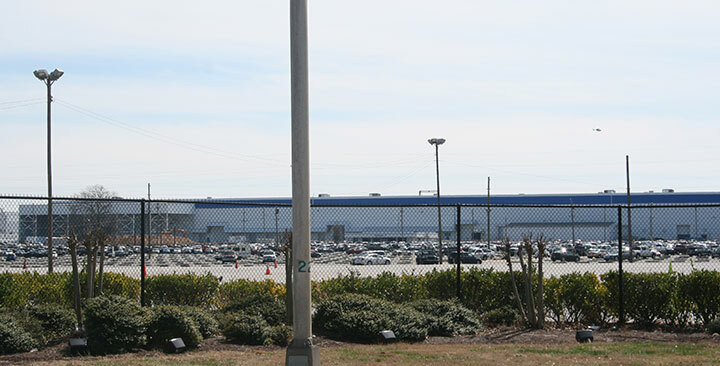 This is looking through the Boeing fence into the plant area. One can see the yellow painted line that guides the tug driver where to put the 737 nose wheel when pulling it over to the airport. Until the bridge was built B-29A's would be loaded on a barge for the short couple of hundred yard journey over the lake to be off loaded. This is looking through the west gate towards the airport. On the shore line on the other side of the bridge the B-29A's would be off loaded from the barge to be able to use the just completed runway extension to takeoff. Located about a hundred yards from shore in 80 feet of water is a sunken PBM Mariner. It sank after hitting debris in the lake. Boeing at Wichita, Kansas B-29 Plant (Now Boeing Integrated Defense Systems-Wichita Programs and Spirit Aero Systems) - The first photo was taken from the tower at the Kansas Aviation Building which was the original terminal at Wichita Airport which during WWII became a huge complex of B-29 manufacturing and air base. 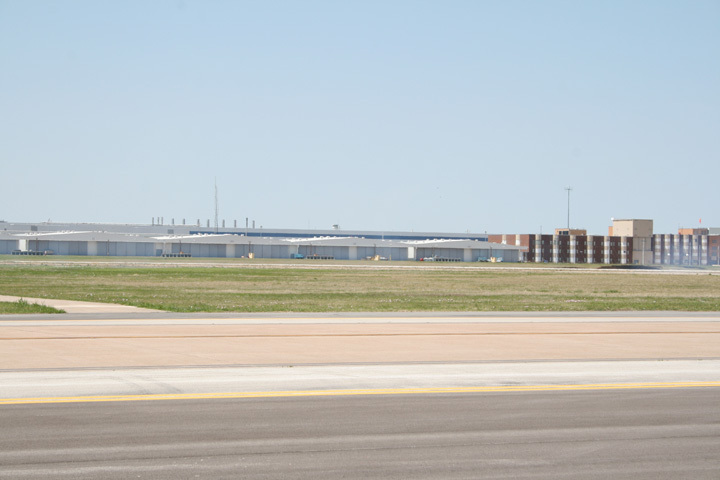 Boeing Integrated Defense Systems at Wichita now works on such projects as Air Force One, Airborne Laser Lab, B-52 Fleet and E-4BSupport, and the KC-135 re-engine program. 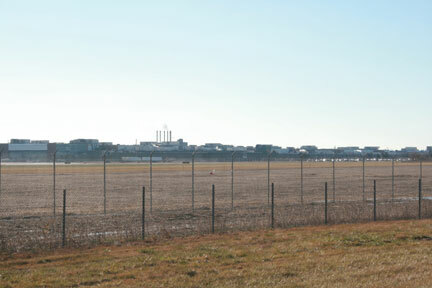 It appears to occupy the complex on the south west apron and a new engineering building SW of that . Spirit Aero Systems now has the main manufacturing plant that built B-29s during WWII where it currently builds subassemblies for Boeing. 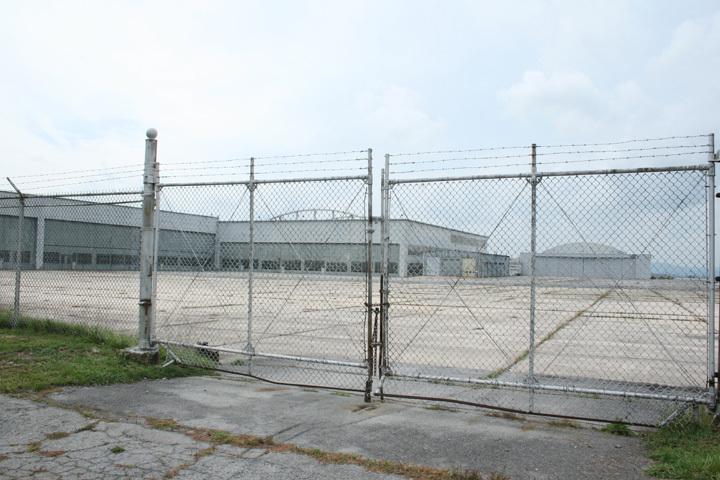 No finished aircraft are made at this location anymore. 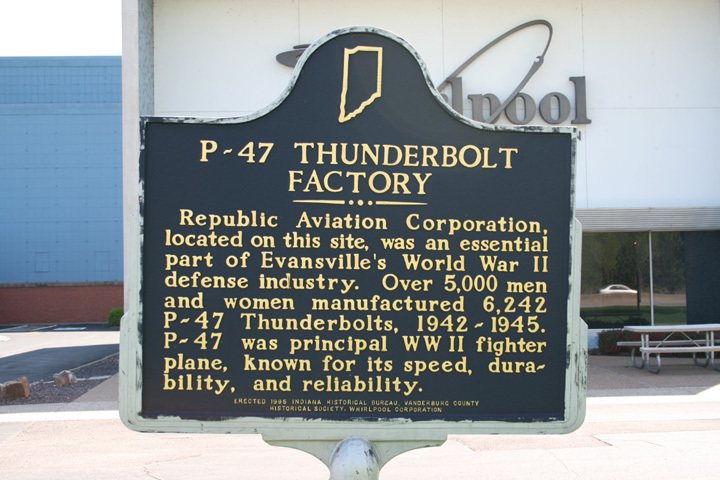 During WWII 1,644 B-29s came out of this location at a rate of 4.2 per day after production started in 1943 along with the Stearman Kaydet for both the Navy and Army Air Corps after Boeing purchased Stearman in 1938. 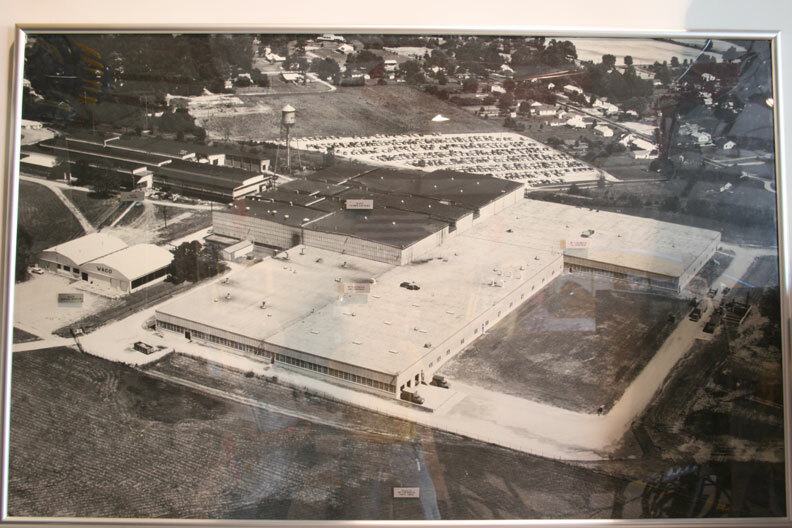 In 1951 the production of over 1,300 B-47s began at this plant and starting in 1970 it began building forward fuselage section for Boeing commercial aircraft and 90% of the 737 was built here. This is located on the SW side of the airfield. 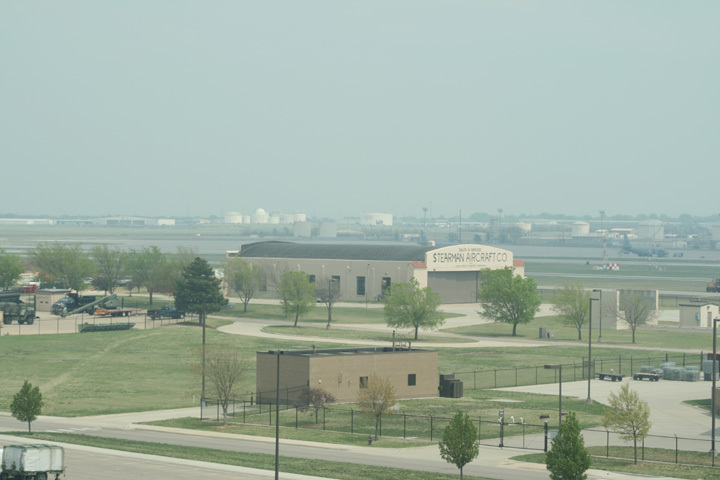 On the east side is McConnell AFB and to the north on the west side is the Kansas Air National Guard. 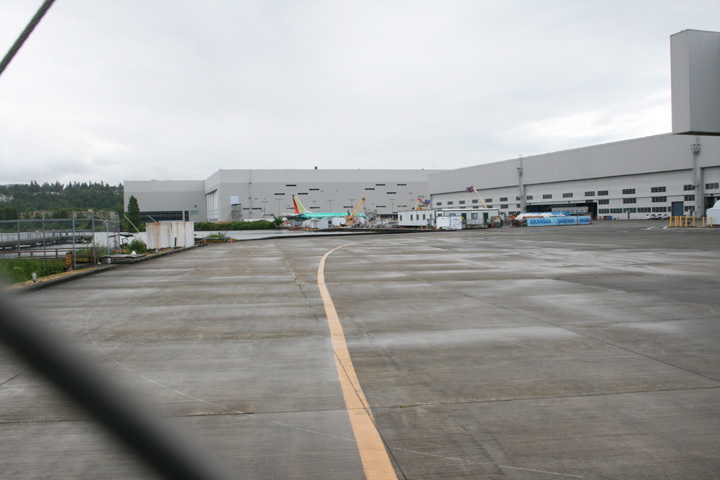 The old Boeing complex looking South West that is now Spirit Aerosystems. 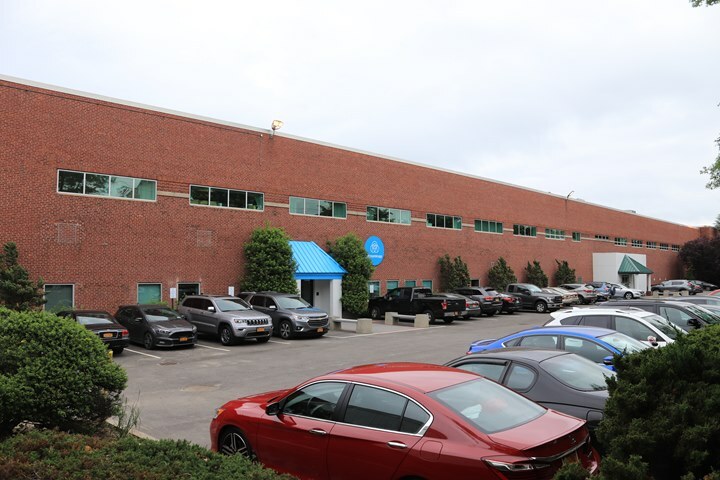 With additions added over the years it is difficult to determine what is original and what is not for someone like me not familiar with the facility. However, the buildings in the background with the triangular shaped natural light window boxes are part of the original complex. 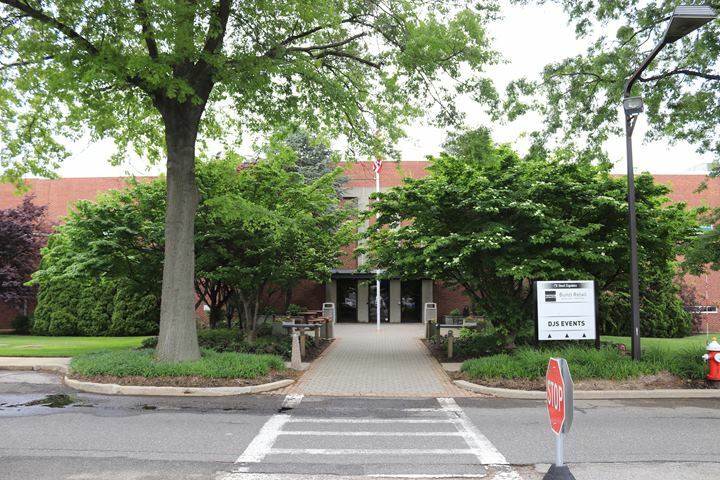 The original Administration Building. The windows have been replaced making it look newer than it is. The original natural light windows can be seen in this photo. More of the original with the Administration Building at the far end. This is a huge complex. 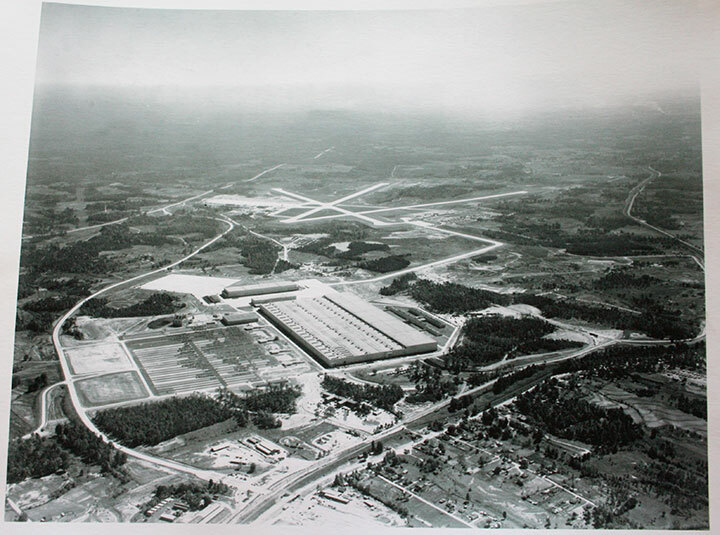 http://www.navairdevcen.org/Pix/aerial.html - Brewster Plant is left center of the photo. 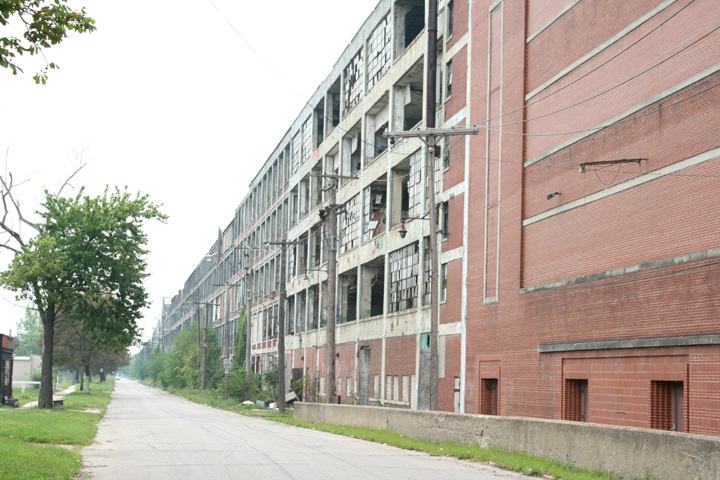 All of this has now been developed and looks to be condominiums, apartments and some light industrial. 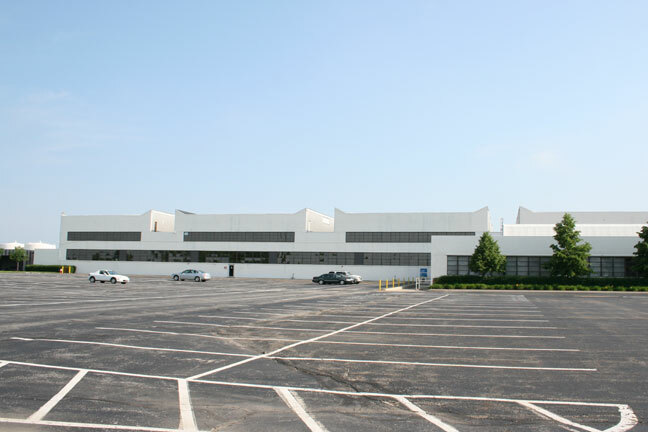 Buick Engine Plant at Melrose Park, IL Buick built this plant during WWII for the manufacture and assembly of Pratt and Whitney R-1830 engines for the Consolidated B-24s. 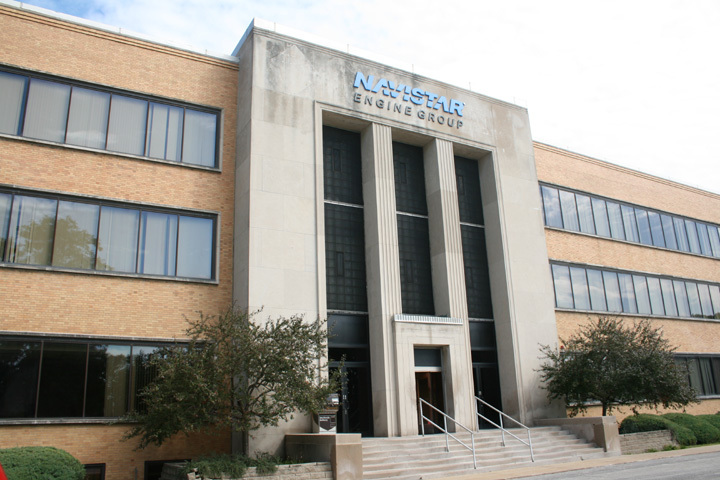 After the war International Harvester (Now Navistar) purchased the plant for engine manufacture. It is still operating in that mode. Looking more to the north the camera can not capture the entire structure. 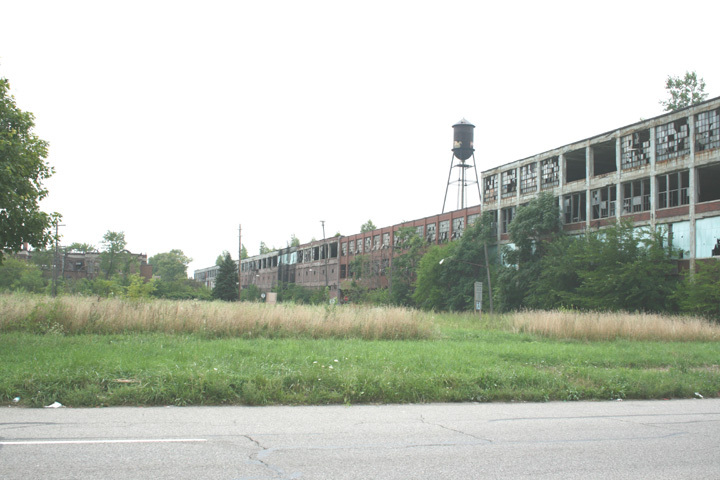 74,198 R-1830 engines were built by Buick in this facility during the war. Looking north. The circle drive is original. Consolidated-Vultee at Nashville, TN (This is now Triumph Aerostructures - Vought Integrated Program Division) It was obviously a rainy day when I took these photos, all from inside the vehicle. I will at some point get better photos on another trip. 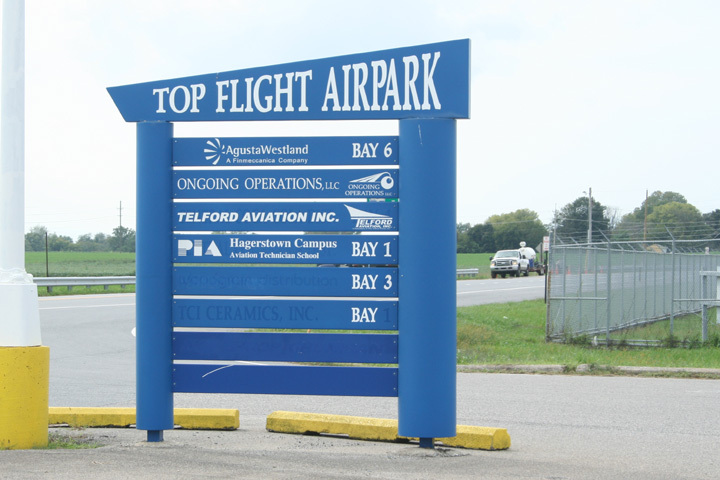 I was there in July 2010 and the sign had not yet been changed to reflect the purchase by Triumph Aerostructures in June of 2010. 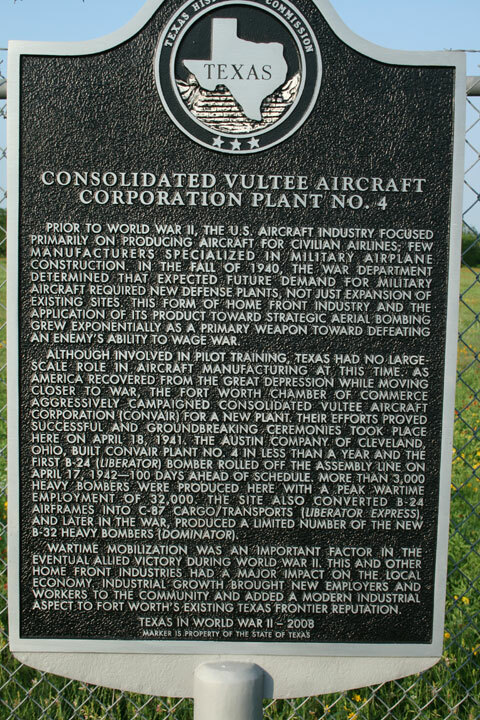 Consolidated-Vultee at Ft. Worth, TX (This is now an Air Force Plant operated by Lockheed-Martin) This was the main manufacturing plant for B-24's by Consolidated during WWII. 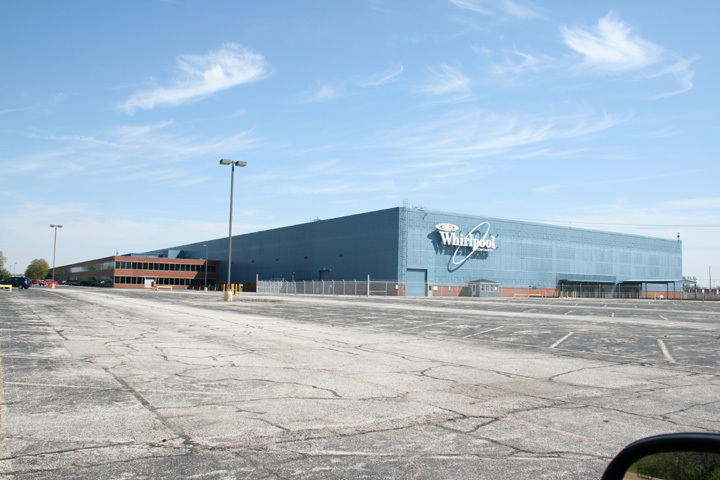 Later when Convair was purchased by General Dynamics the F-111 and F-16 were built here. Now it is the focal point for the manufacture of the new F-35 Joint Strike Fighter. 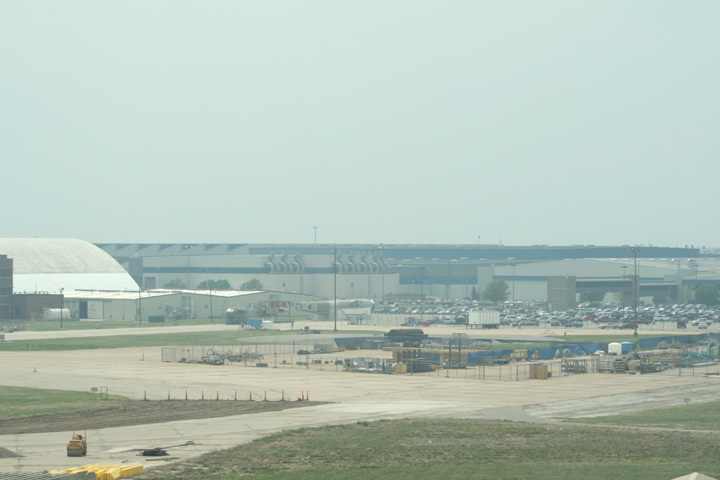 The next series of photos attempts to capture the current Lockheed Martin complex from north to south as seen from the NAS Fort Worth JRB during an air show. There is some overlap in these photos. After WWII the plant built B-36s, which could be brought across the runways to what was then Carswell AFB for operational service. 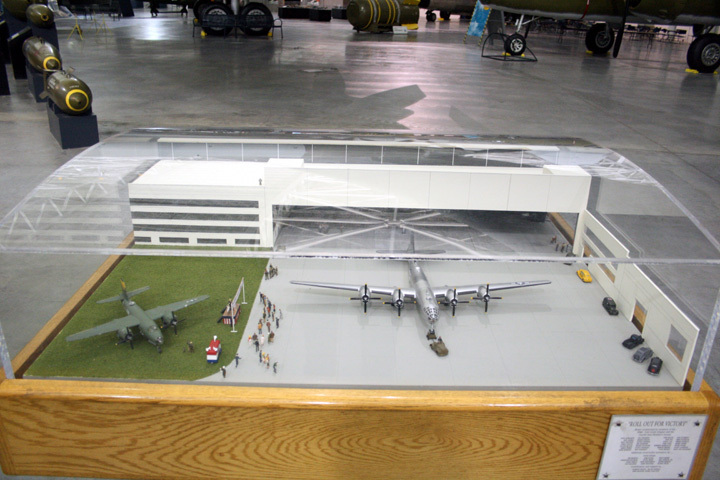 The mile long original B-24 plant can be seen behind the hangars in the foreground. The entire complex today is over a mile long. 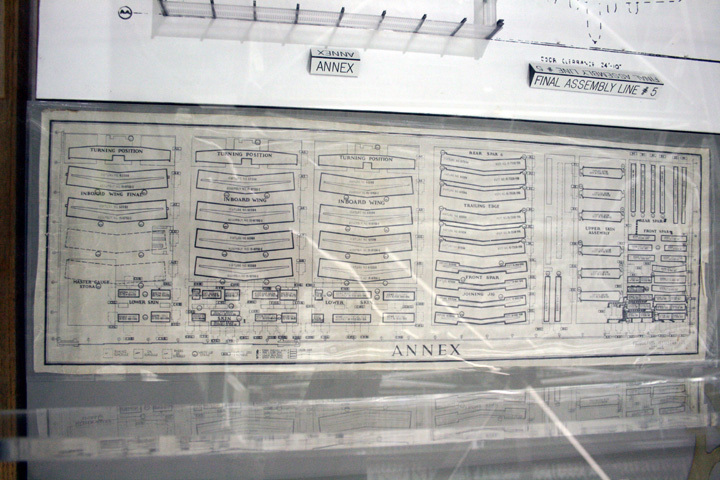 F-111s and F-16s along with F-22 components were later made in the plant. According to a Lockheed Martin PR representative I talked with at the Tyndall AFB show earlier in the year, around 250 F-16s remain to be built for foreign customers and are still being constructed somewhere in this complex. 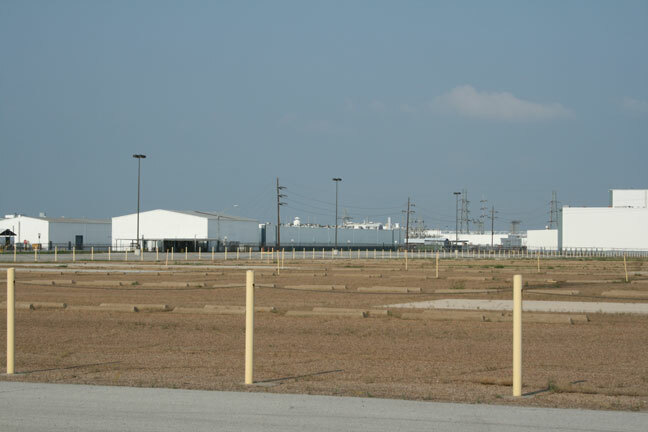 However, the mile long original plant is being reconfigured for high production F-35 production. 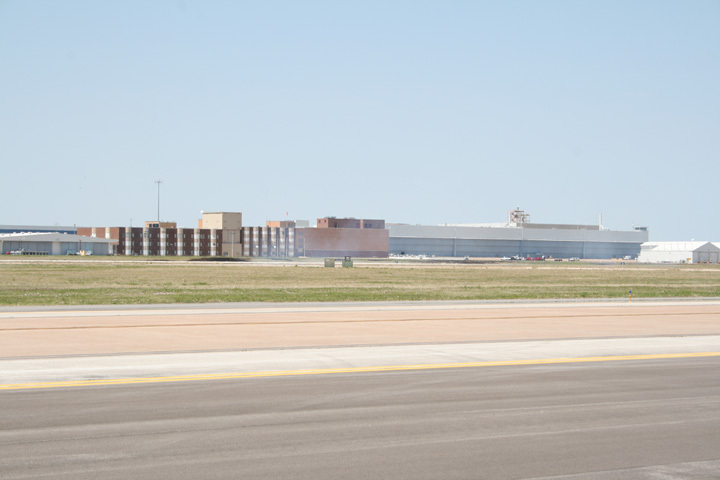 Starting in 2016 one F-35 a day will start rolling off the assembly lines in the mile long building (This is the same rate at which the F-16 was built at peak production). 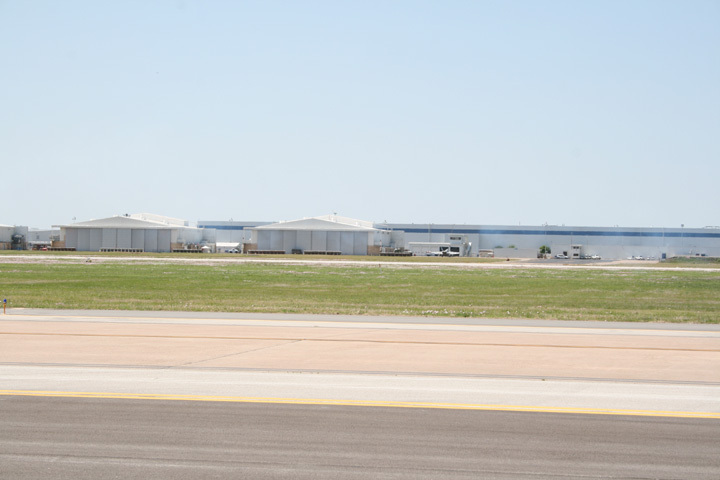 They will then come out to these hangars for final flight preparations for flight tests and final delivery to the US Air Force (F-35A), Marines (F-35B) and Navy (F-35C). 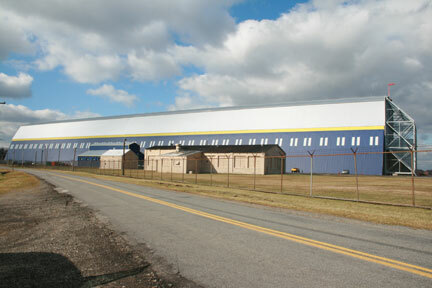 Current flight test operations use these hangars for pre-flighting of the F-35s currently undergoing tests. 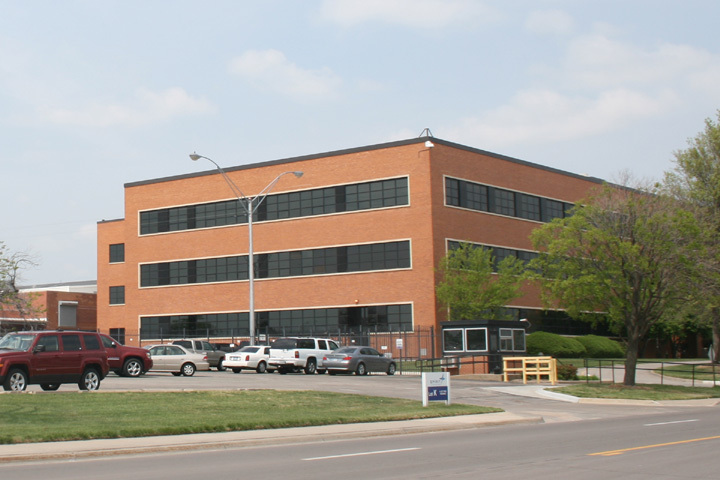 Curtiss-Wright (Now Columbus International Airport Business Park) Plant at Port Columbus Airport, OH - Curtiss built SB2C Helldivers, S03C's, SC-1's and SC-2's for the US Navy during WWII. 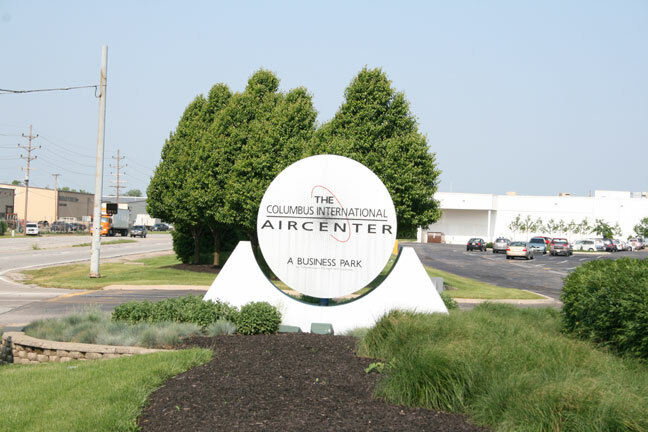 The business park is occupied by multiple businesses and aviation companies and Columbus has put to good use this asset left over from WWII which was built by the Navy. 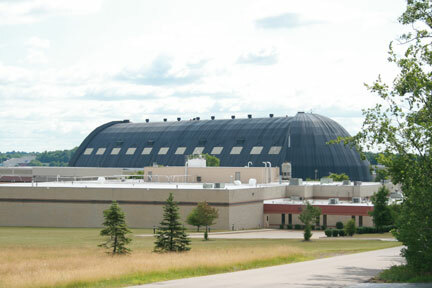 After WWII North American used the facility to built Furies, Vigilantes, Buckeyes, and Broncos. Corner stone indicating the building was built in 1941. 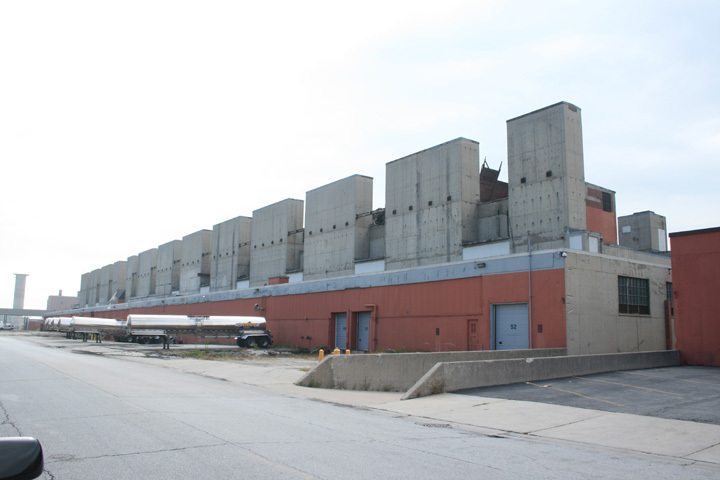 Dodge (Chrysler) R-3350 Engine Plant at Chicago, IL - This plant produced 18,349 Wright Radial Engines for the B-29 program in WWII and consisted of 19 total buildings that covered 82 acres and contained 9,000 machines. 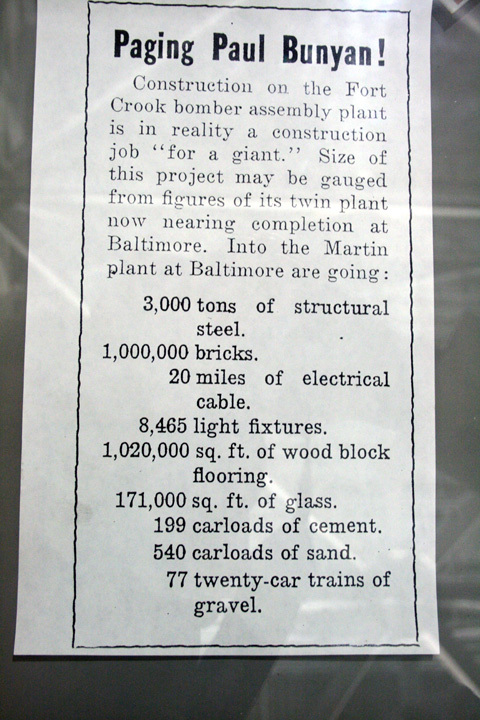 In other words, this was a huge complex. 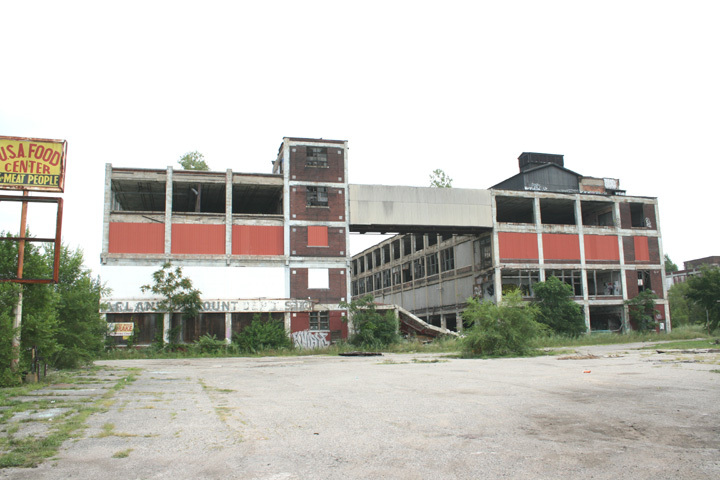 After WWII Dodge did not need the facility and it was turned back over to the government. 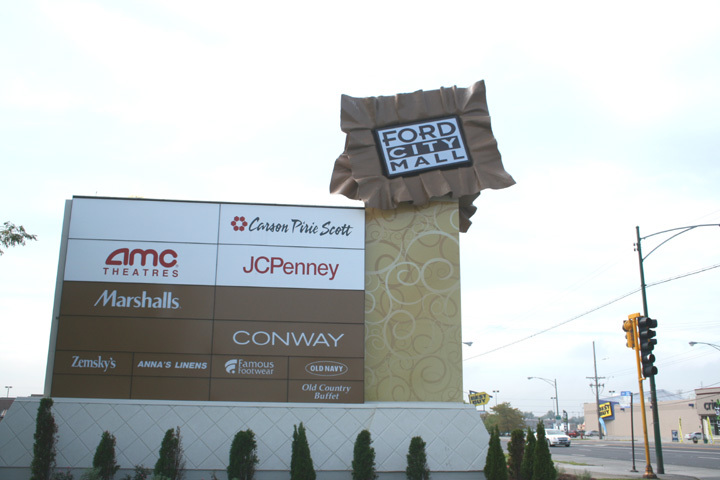 Later Ford Motor Company used it which is why the current shopping mall located in some of the original buildings has been named Ford City Mall. 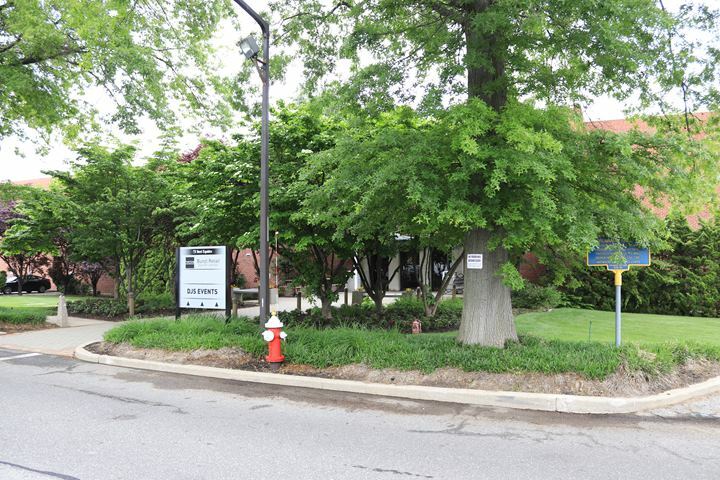 Other parts of the complex are owned by Tootsie Roll and other miscellaneous businesses. This is assumed to be the SW corner of the original building. 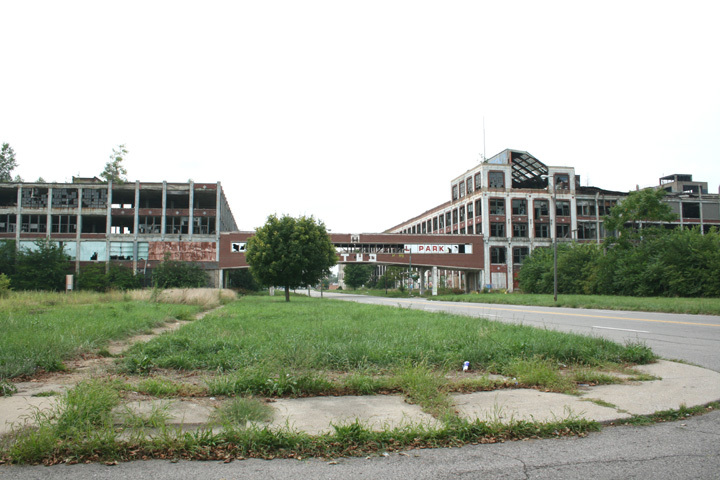 One can not recognize that this was once a part of an 82 acre complex that produced over 18,000 engines in just over two years. 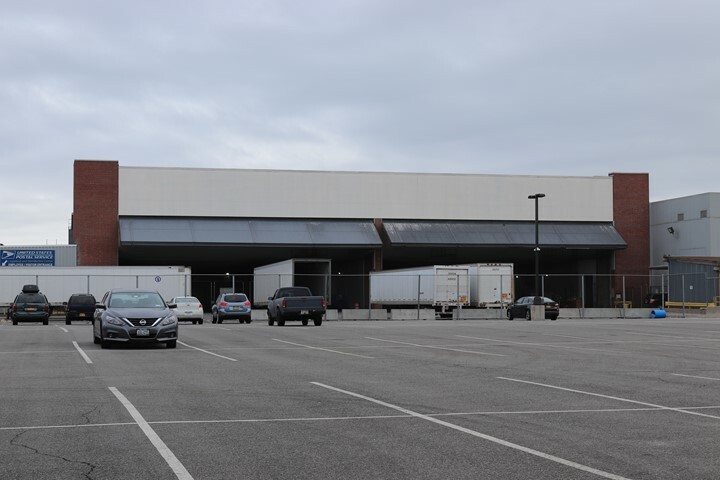 The mall is actually two separate buildings as apparently some of the original structure has been torn down to make way for a parking lot. On the east side this looks like some of the original truck docks. One of two surviving powerhouses at the complex. This one is on the NE corner. 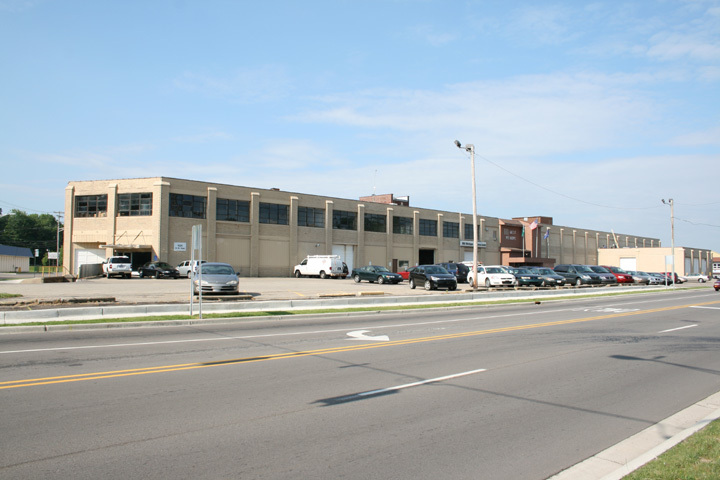 This building on east side shows the reinforced arched rib concrete construction that was developed by the architectural firm Albert Kahn and Chrysler Engineers. It cut the amount of steel used by half during a time when it was in short supply. Our understanding that all of the original construction would have had this roof structure. 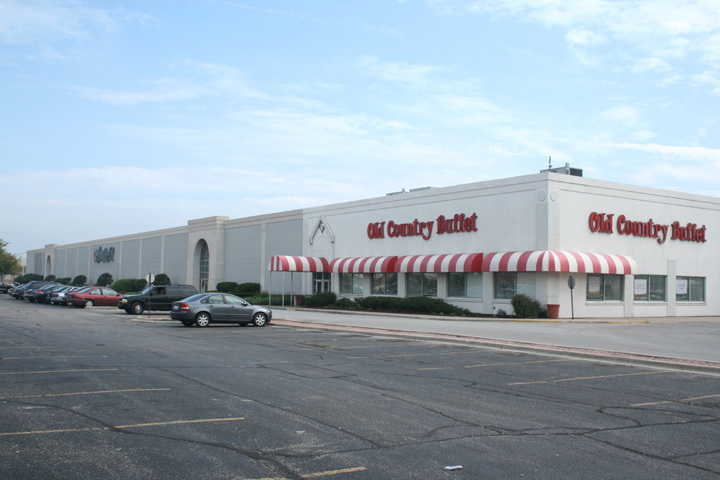 This is over on the north side which is now owned by Tootsie Roll. This was the live engine test area and the stacks are for the exhaust and noise abatement. Each and every one of the 18,349 engines built was tested for four hours. 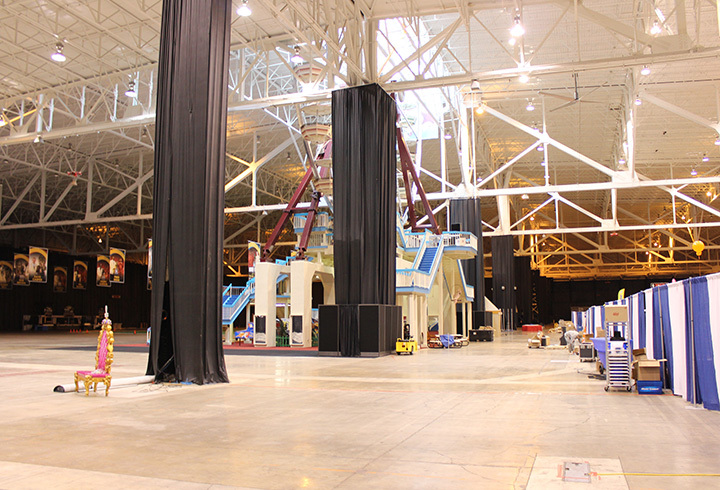 Then they completely torn down and inspected. If good, the engine was rebuilt and shipped. If defective, it was rebuilt, retested and re-inspected all over again. This was standard procedure for all aircraft engines built during WWII. 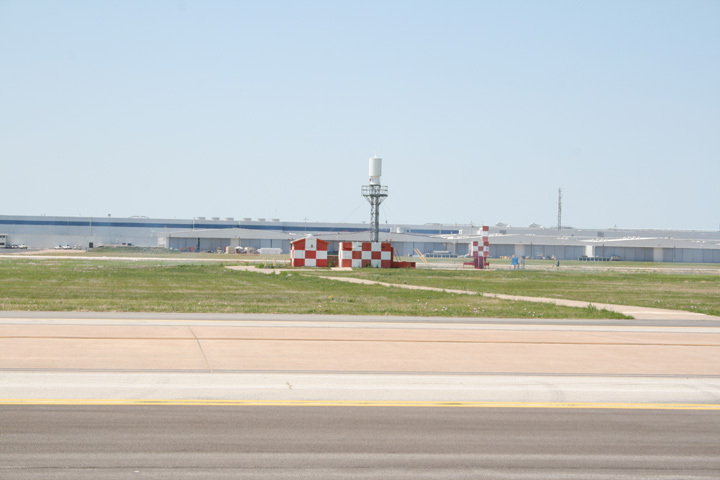 Douglas A-26, A-24 and B-24 Plant at Tulsa, OK - This is all that remains of the original plant that was 7/8 of a mile long and was originally built to assemble B-24s with parts from the Ford Willow Run Plant. 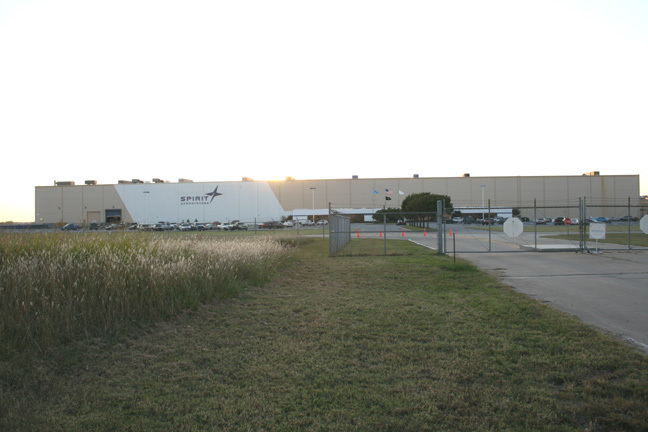 Photos were taken late in the day with the sun going down behind the plant. 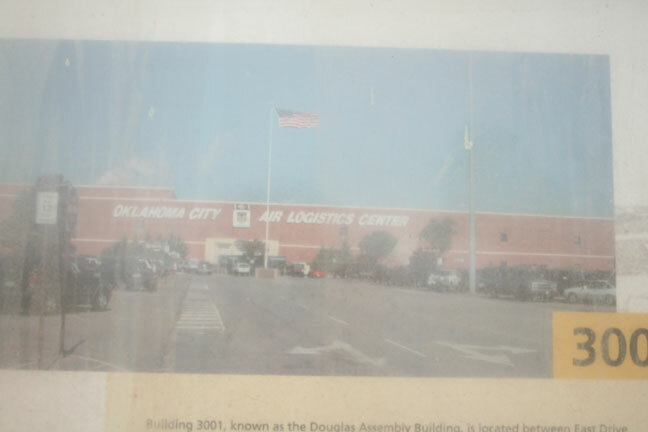 Douglas C-47 Plant at Oklahoma City, OK - The building is still there and now located on the east side of Tinker AFB which is South East of OK City. 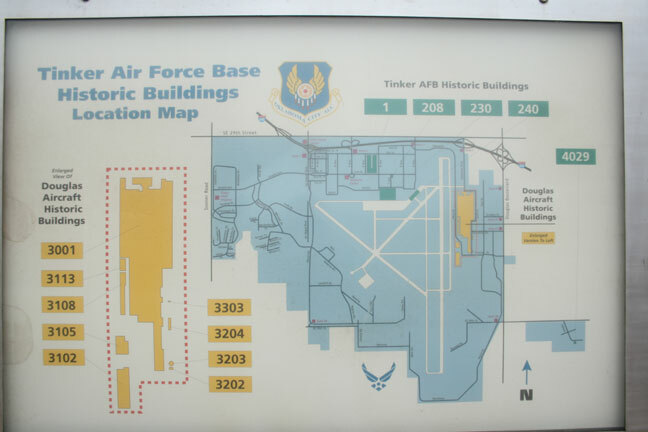 The series of photos below were taken from an outside display board at the Air Park located at Tinker. The displays are covered by Plexiglas so the photos are somewhat blurred. 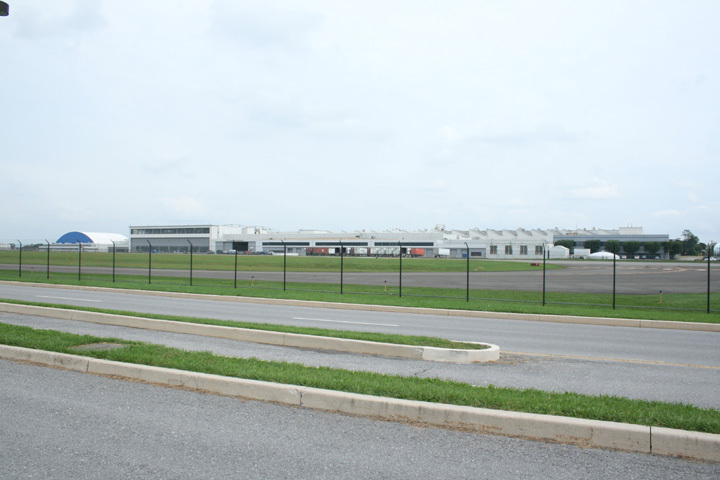 Fairchild Plant at Hagerstown, MD - This is now an Air Park with commercial tenants. 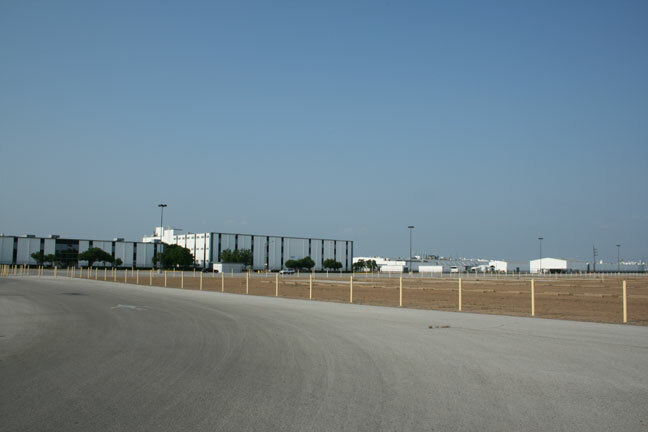 This photo is taken looking east from the parking lot of the aircraft terminal. 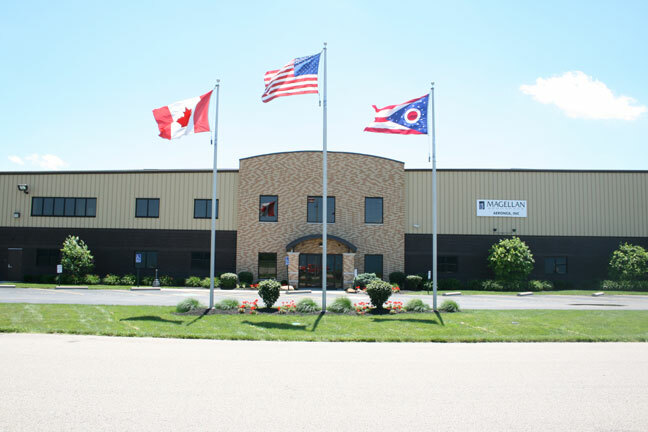 This part of the plant has been given a modernized facelift. Here we are looking at the SW corner of the plant and then down the west side as seen in the previous photo. 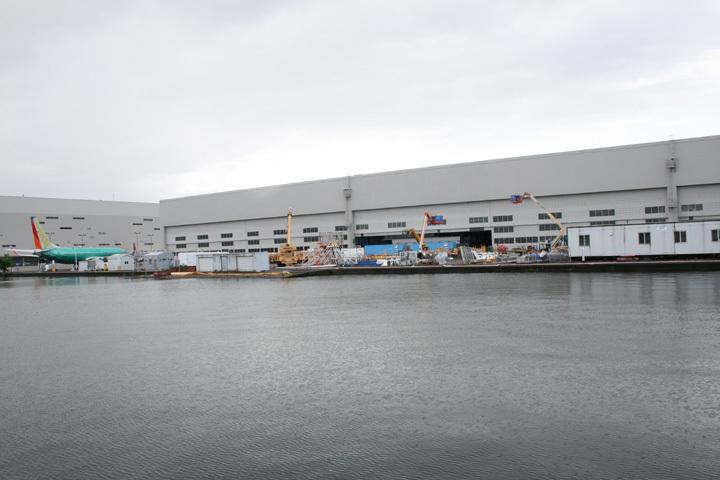 On the right side of the photo which is south one can just make out that this is the Augusta-Westland hangar. Looking down the south side to the east. This is the backside looking west. Note the difference in from the other sides of the complex. To get to this area one has to take a back road along the airport's east perimeter. 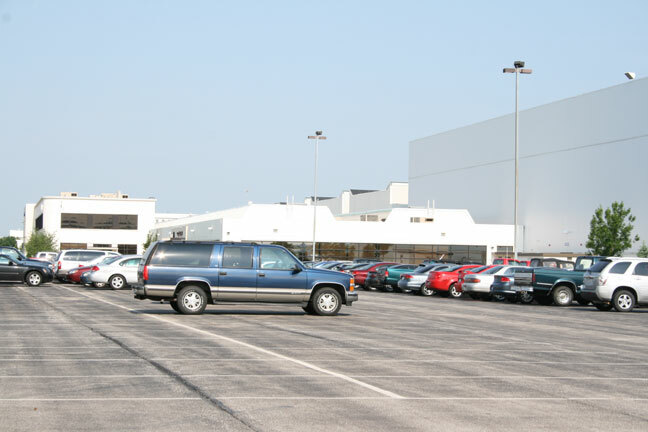 Fisher Body Cleveland Plant Aircraft Division Plant 2 (Now the International Exposition Center) at the Cleveland Airport, OH - This plant was built in 1942 to build 200 B-29 bombers. 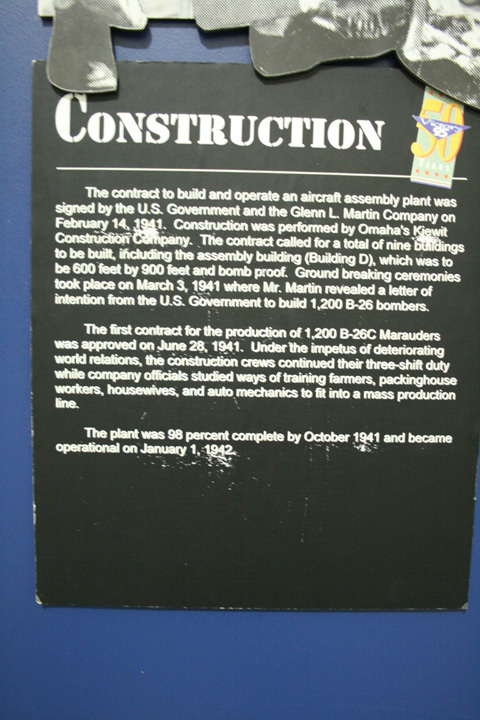 While under construction the US Army Air Force changed plans and moved the B-29 production to the Martin Omaha, NB plant which had been making the B-26. 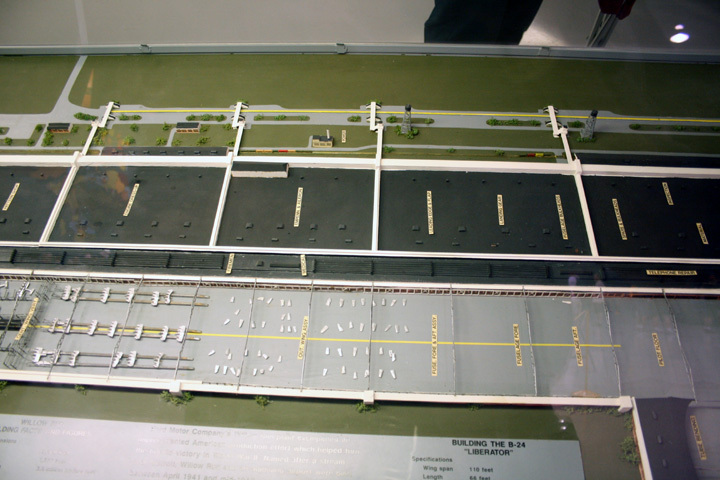 Instead Cleveland Plant 2 became a primary parts supplier for not only the B-29 project. 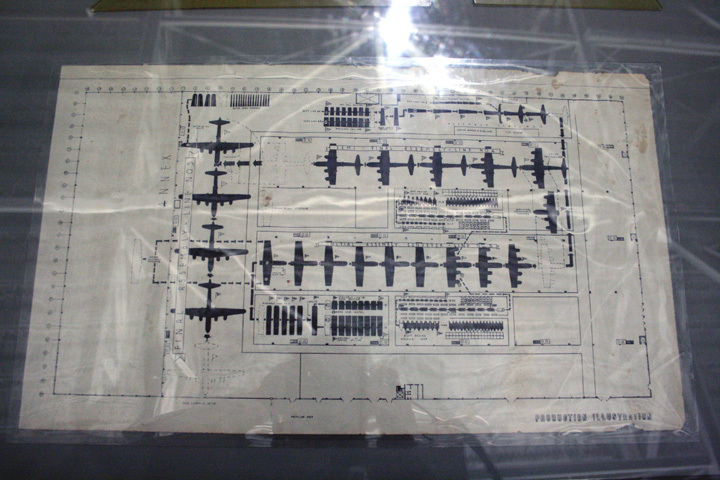 Construction of the eight XP-78 and six P-78A Eagles did take place here along with special conversions such as the B-39 which was a B-29 with Allison V-3420 engines and converting the Douglas B-19 to the Allisons. 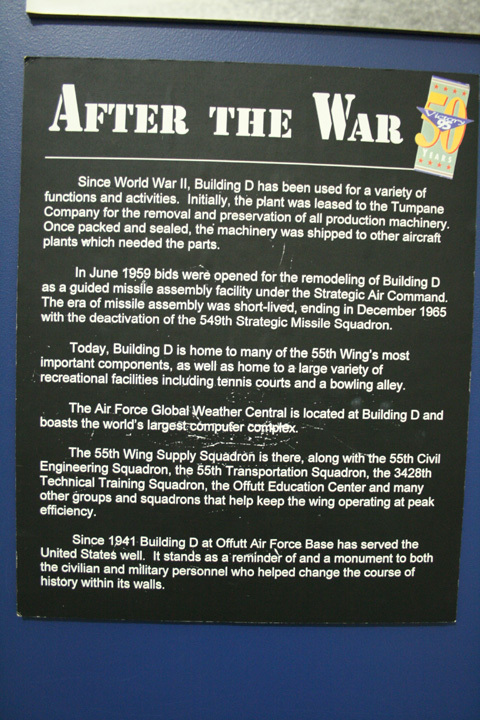 Several historical sources have misinterpreted history and claim that Cleveland Plant 2 built B-29s. It was built for that purpose, but never did do to the changing demands of the war. 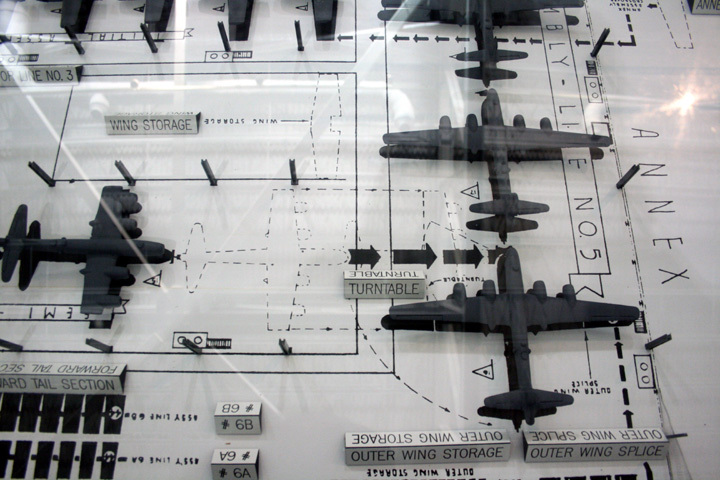 What it did produce was 13,772 B-29 engine nacelles. 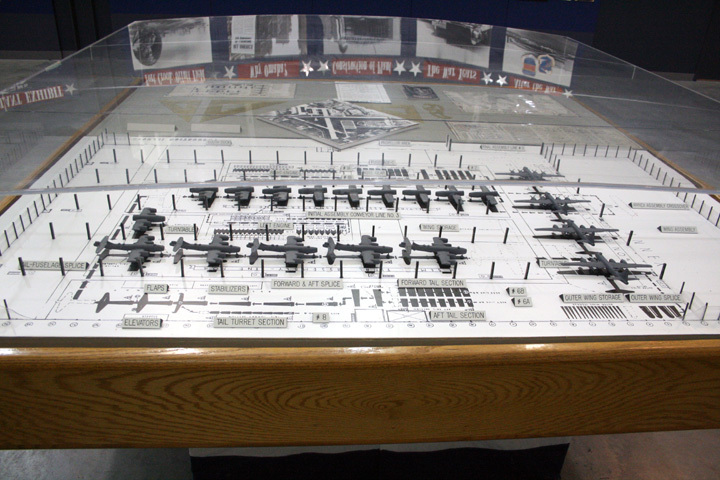 In the 1950s the plant became a Cadillac tank plant. 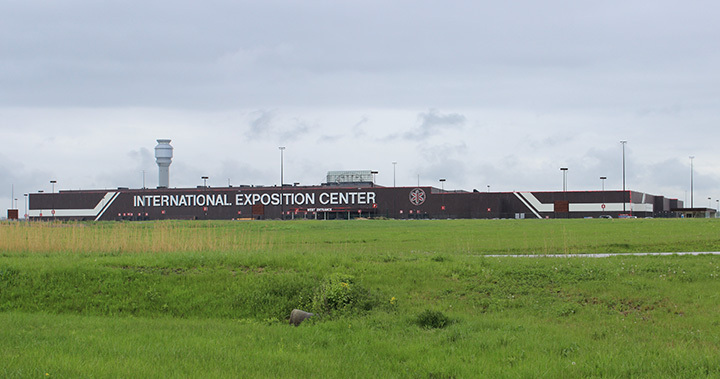 Today the former B-29 parts plant and tank arsenal is the international Exposition Center. 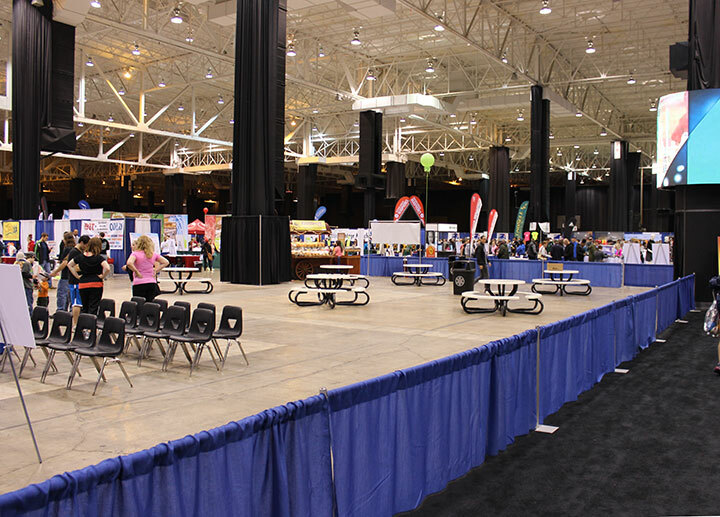 Some of the huge amount of space available for use in the center. The day I stopped by to photograph the plant it was being used to hand out credentials for an upcoming marathon in the area. I was able walk in and see the insides of the facility. 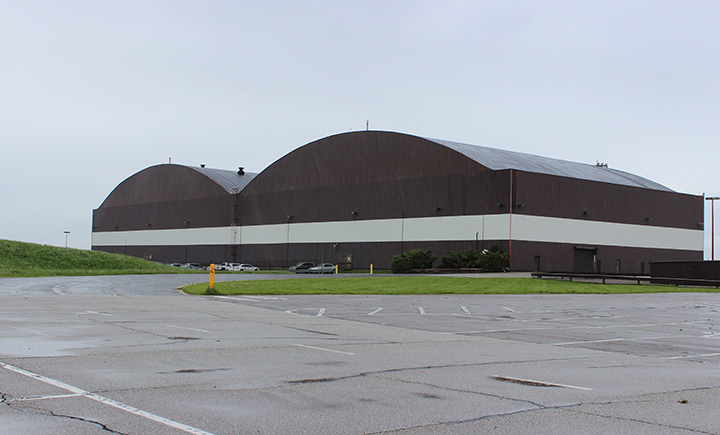 These two hangars are part of the original facility and is where the experimental V-3420 Allison engines were added to the B-19 and B-29. 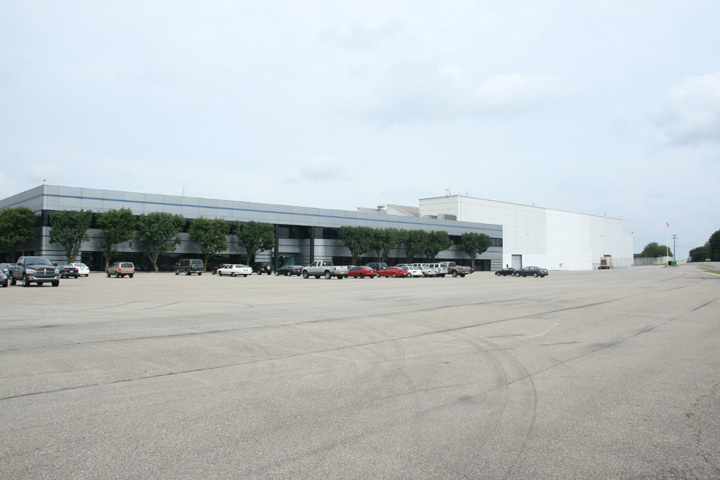 Ford B-24 Plant at Willow Run, MI - With the exception of the paint hangar at the end of the line, this plant has been razed. Photos will be left on this site for historical purposes. 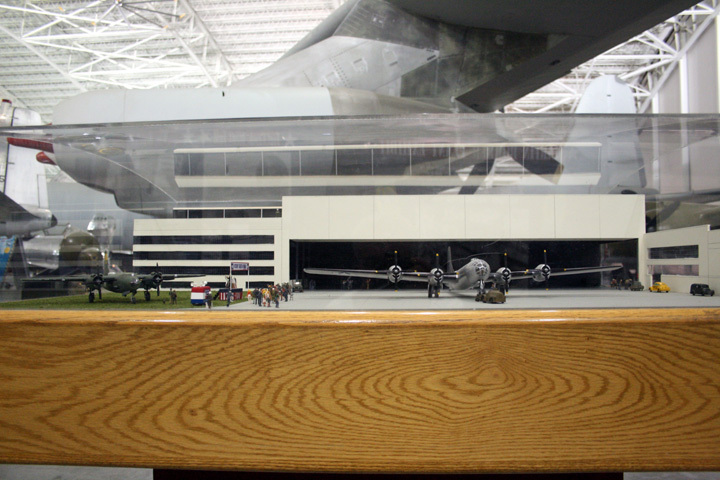 The following photos are from a model display at the EAA Museum in Oshkosh, WI. The square footage is 3.5 million. 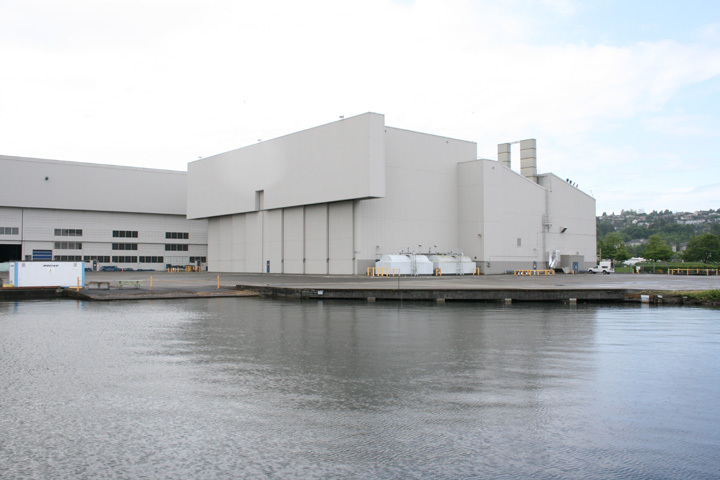 This is the west end of the plant looking south. This magnified view of the upper right hand corner of the previous photo shows what functions took place in the SW corner of the plant. This is looking from west to east at this same section. 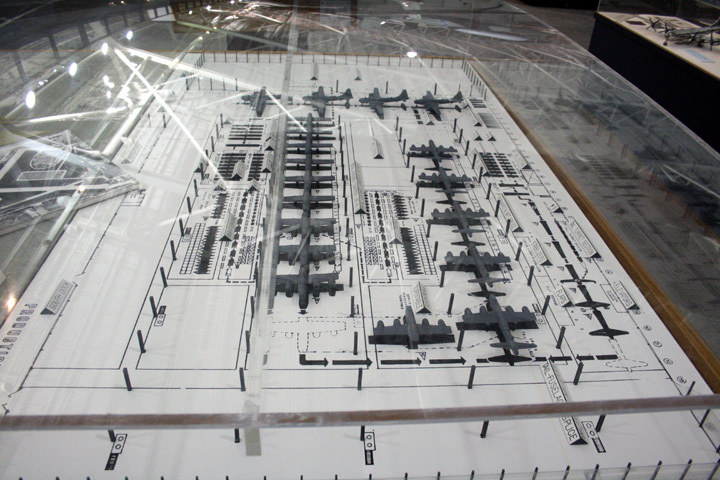 Aircraft assembly will be on the left or north side and manufacturing of components on the right or south side. 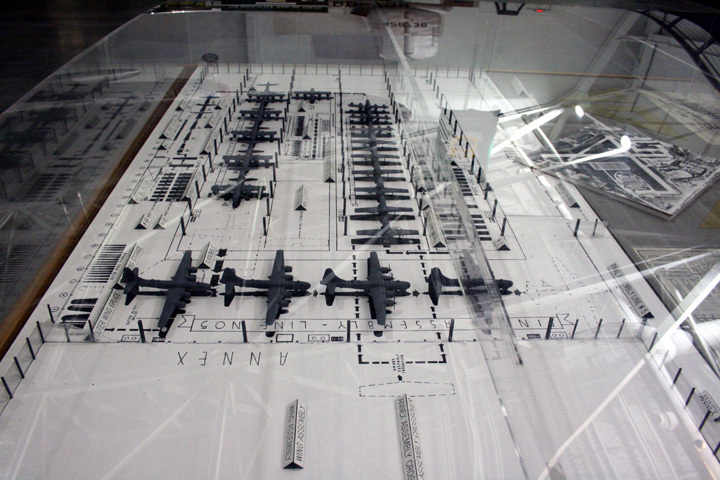 Willow Run also supplied components for B-24 aircraft assembly at other locations. We are now looking south again as we move east. To the right of the photo is the location of the previous photos. 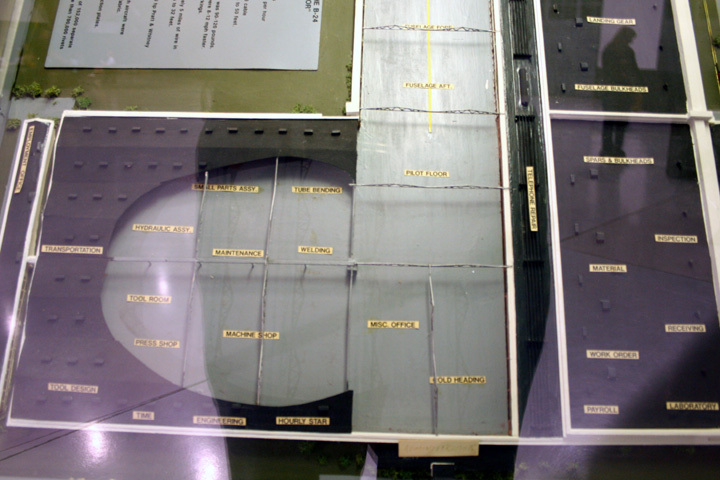 Note that assembly of control surfaces and wings are taking place. 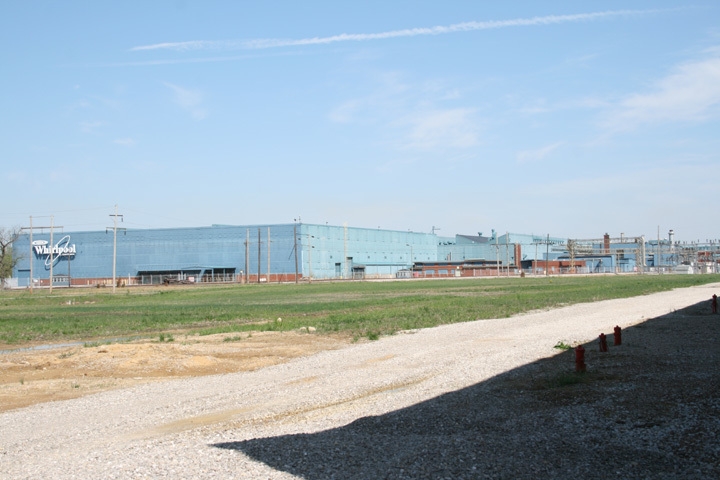 Again on the south side of the plant are the manufacturing operations supplying the assembly line. 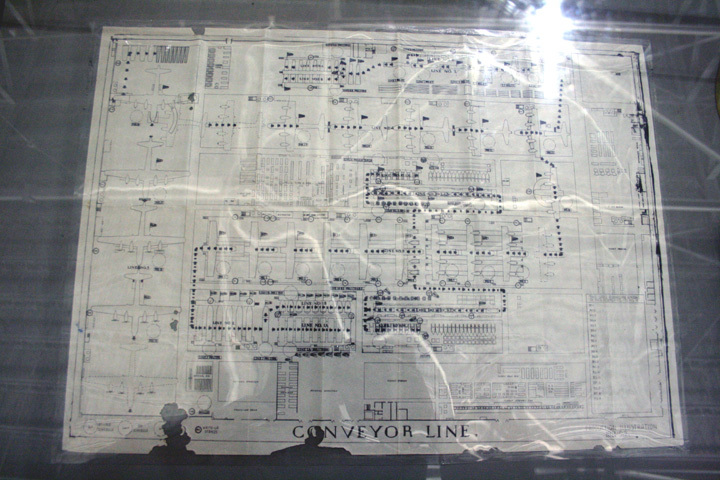 The final assembly and then the paint shop in the upper left hand corner or the SE corner of the plant. The reason the plant makes a left hand is that this keeps the plant totally in Washtenaw County, MI. If it extended further east it would have been in Wayne County, MI, which had higher property taxes. 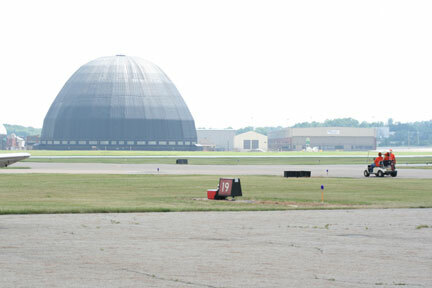 Goodyear (Now Lockheed-Martin) Airdock at Akron, OH - The red area on the end of the Airdock caught fire in August of 2006. 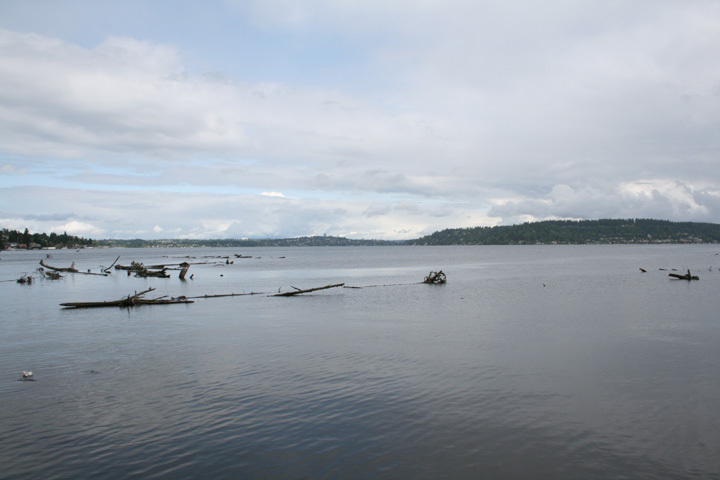 The photo was taken in July of 2007. Updated photos taken in June of 2008. Fire damage has been repaired. 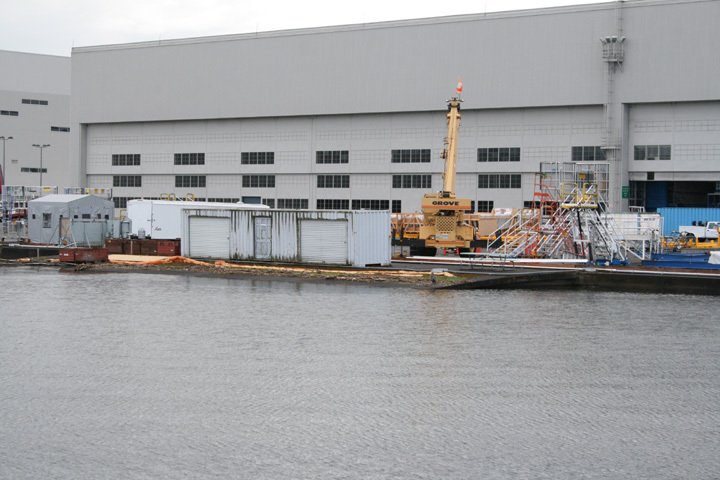 Looking the Airdock on the left and the building to the far left is the Corsair assembly building. 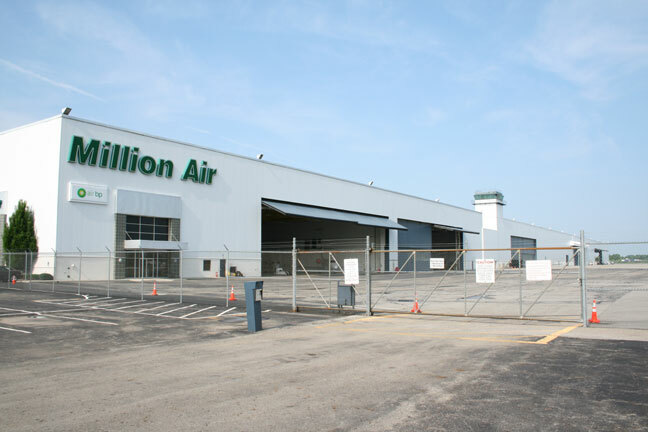 Williams Aviation is an FBO that now uses the old FG-1 assembly building at Fulton Field in Akron. 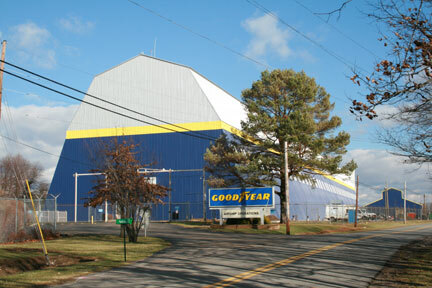 Goodyear Blimp Hangar at Wingfoot Lake, OH - Most of the WWII airships were built at this location. 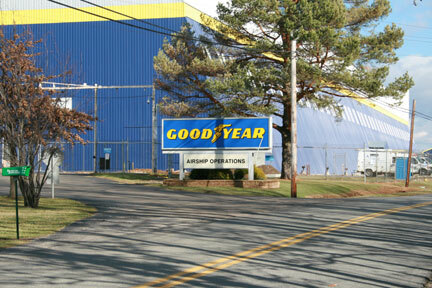 There were other buildings but this one still remains and is the current home of the Goodyear Airship "Spirit of Akron". Grumman Plant 2 at Bethpage, NY - Much of the original World War Two Grumman Plant 2 and post war buildings are still in existence, although they have all been repurposed for other business's from the building of F6F Hellcats and TBF Avengers that were built here 75 years ago. 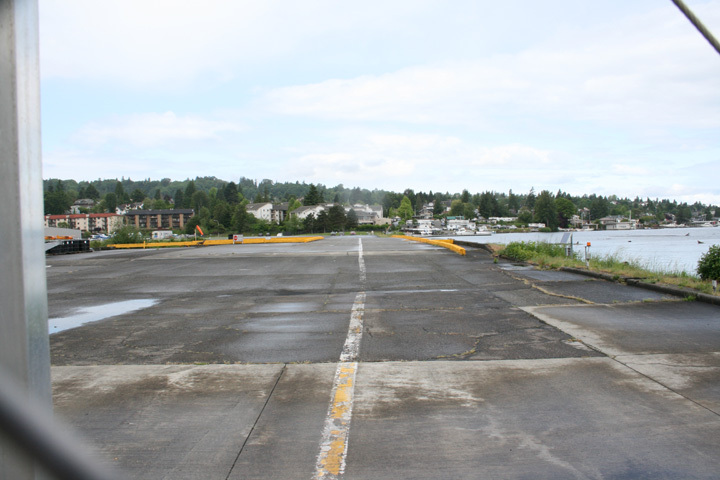 There is no evidence of the former runways on the east side of the complex. This is the west side of the south end of Plant 2. 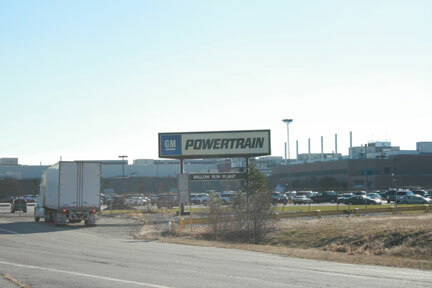 It is also the south end of Grumman Airport Road. 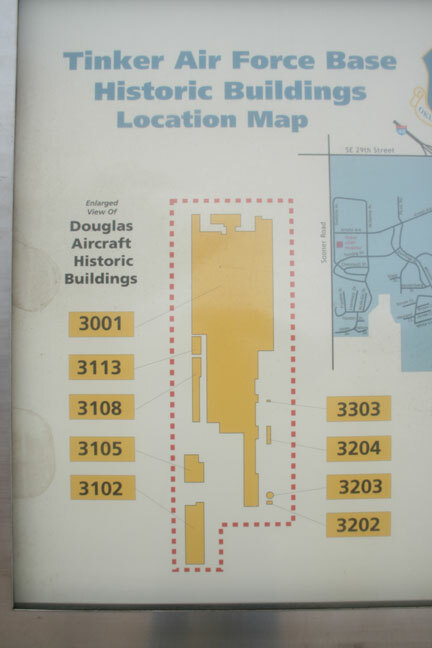 The building runs north to north west and is 1,000 feet long. 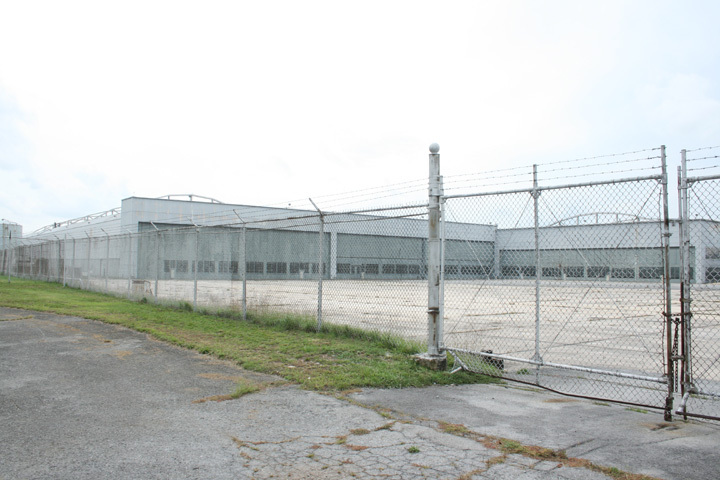 Half way down Grumman Airport Road is the main entrance where the corporate staff and engineers entered during WWII. 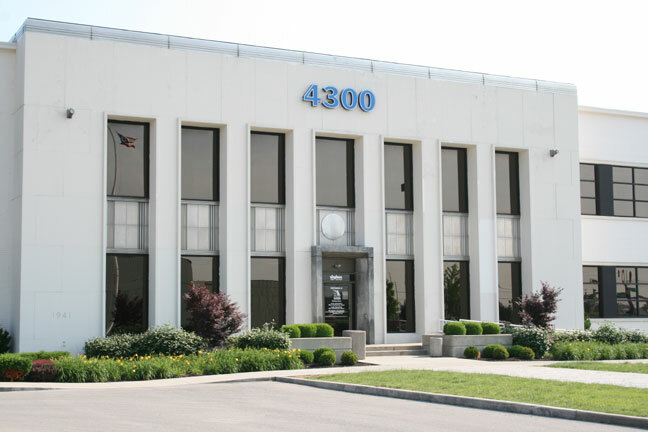 At the north end of the building there are several other entrances to facility. 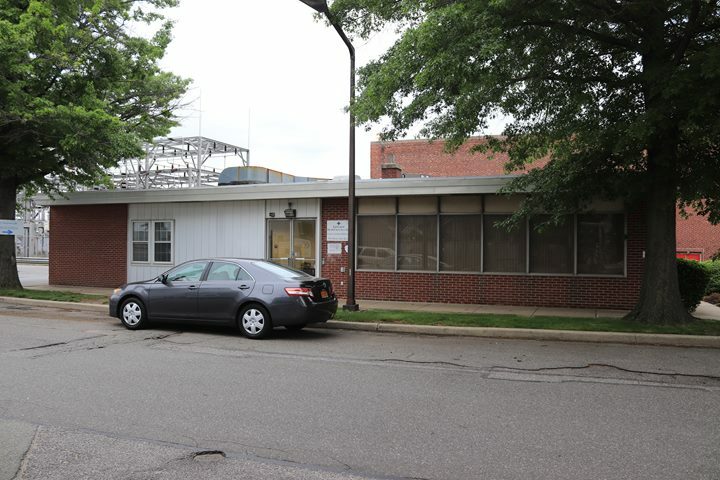 At the far north end of Plant 2 is this small building, which may have been the employment office during WWII. 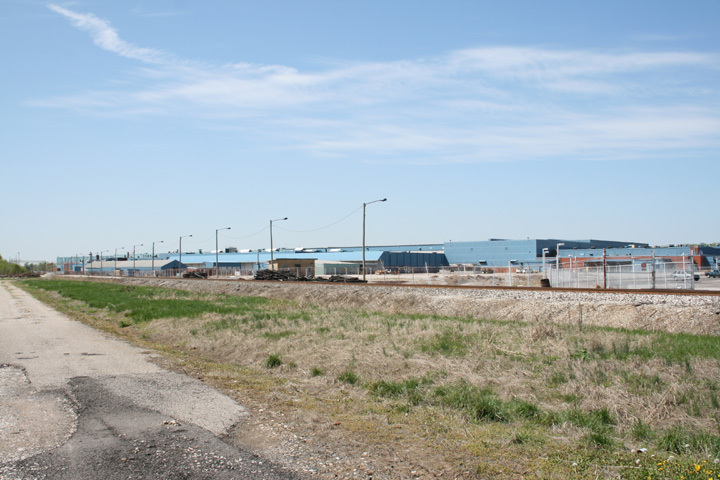 The next three photos are on the east side of Plant 2, looking west. This is the south end of the complex. 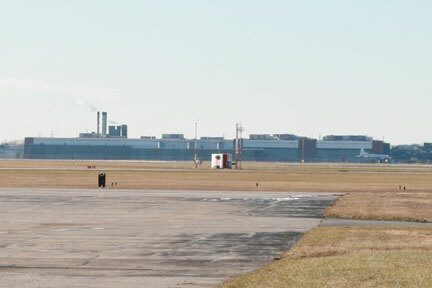 It is on this side that the runways for the plant were located. 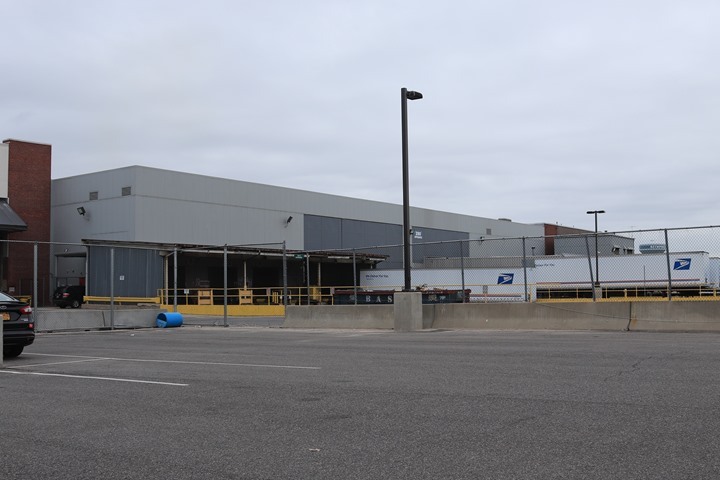 Today the US Postal Service is using the areas where Hellcats, Avengers, Tigercats, and Bearcats exited the final assembly areas as truck docks. 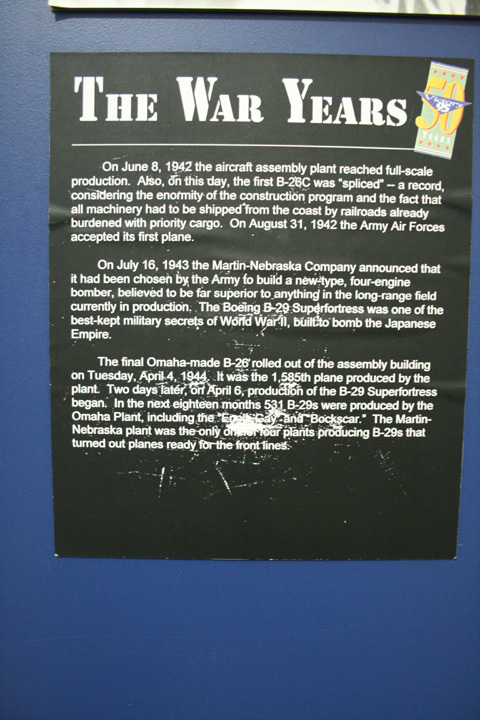 Martin Plant at Omaha, NE - The photos below were taken at the Strategic Air and Space Museum in Ashland, NE which is located right off of I-80 about 20 miles west of Omaha. This is an excellent museum and should be a stopping point of all aviation enthusiasts traveling across the country on I-80. 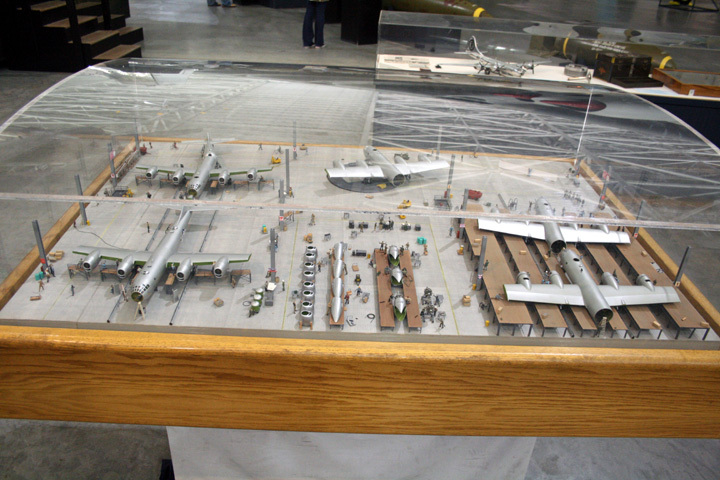 Included among all the aircraft displays are models of the Martin Bomber Plant in Omaha that was originally built to produce B-26s but then was converted to one of the five plants to build the Boeing B-29 Superfortress. 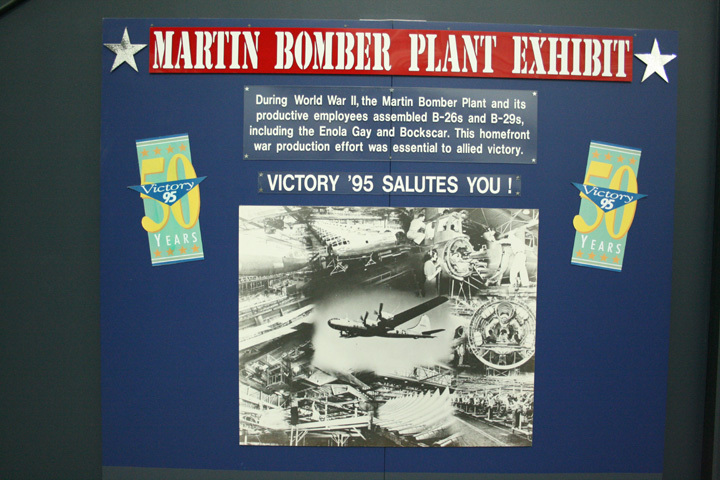 The Omaha plant went on to build 515 B-29s, including The Enola Gay and Bockscar, after completing construction of 1,585 B-26s for the war effort. 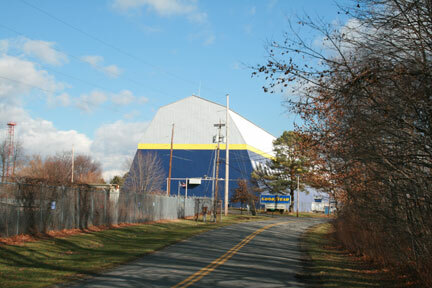 The Omaha Plant was a reverse image of the plant built by Martin in Middle River, MD to also produce the B-26. Below are photos of this great display at the museum. 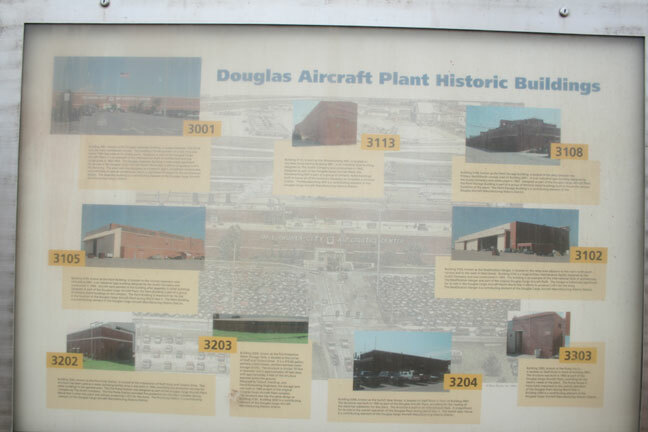 Today the plant still exists and is located at Offutt AFB in Omaha. Wood blocks from the floor. Installation of would obviously have been labor intensive. 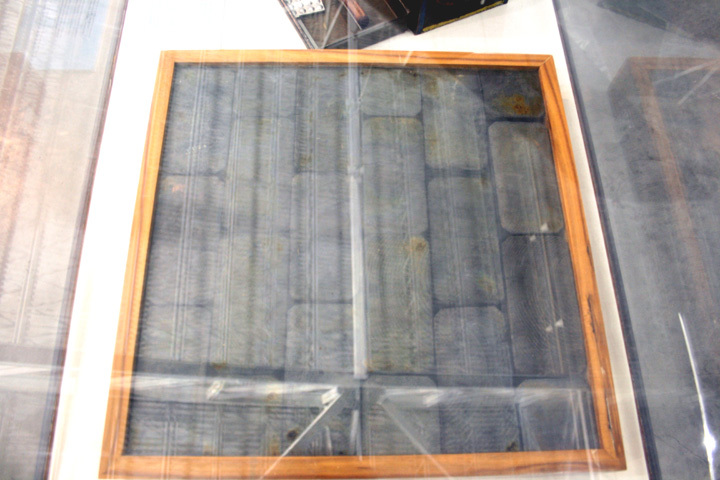 This construction was typical of the era and was also designed to absorb oil spilled on it. Nash-Kelvinator (Mt. 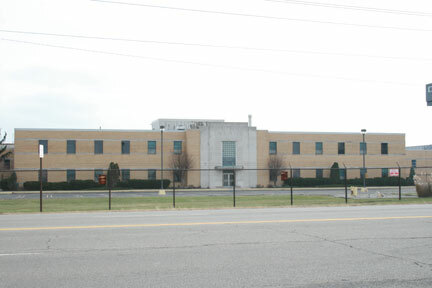 Hope Ave Plant) in Lansing, MI - This building is located at the corner of Washington Street and Mt. Hope Avenue. 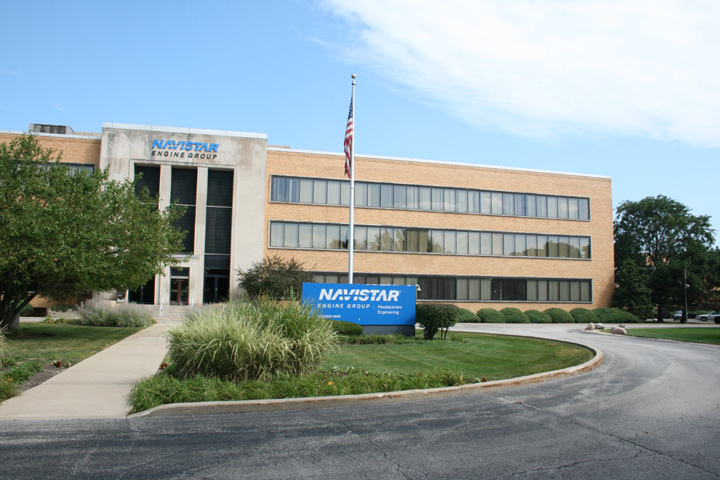 Originally built by REO, which was about a half a mile north on Washington, it was used by Nash-Kelvinator during WWII to produce 158,134 Hamilton-Standard propellers. 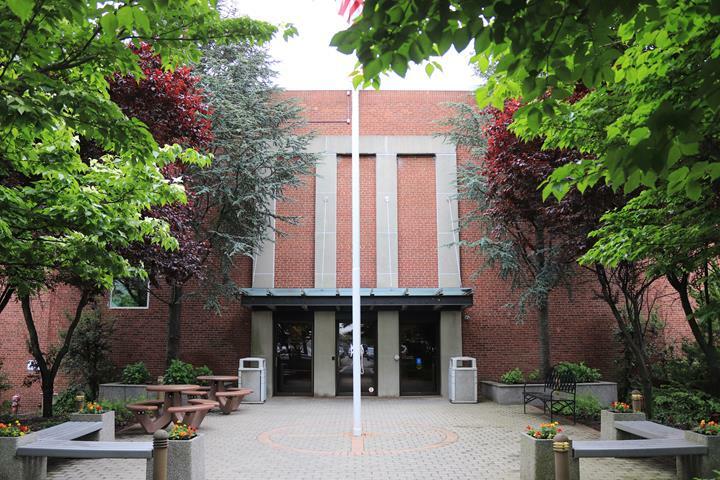 I grew up a mile away and walked by this plant for three years going to Junior High School, and then drove by it for 5 and a half years when I went to college. I was unaware of this building's historical or family significance until early 2011. My grandfather worked here during WWII and was foreman in the propeller balancing department. 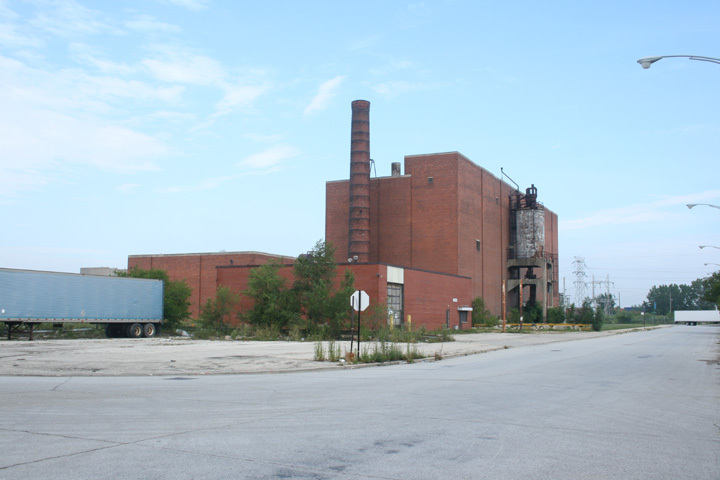 The location of the plant allowed him to walk to work and save valuable rationed gasoline. 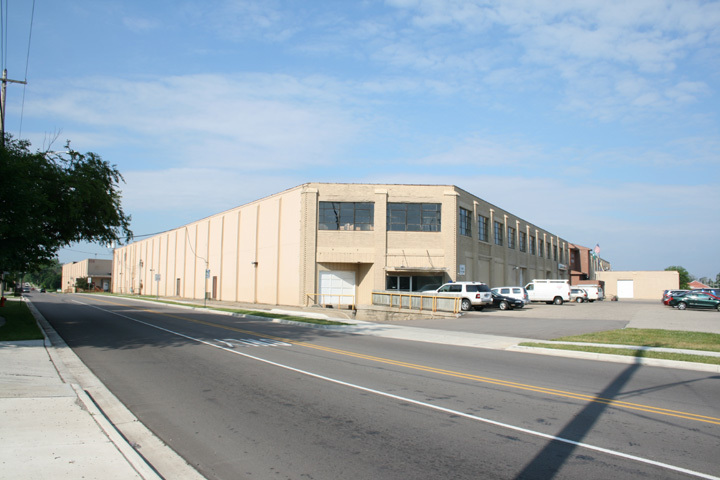 After WWII Motor Wheel Corp. occupied the building for a while until it moved out to the north end of Lansing. Around 1960-61 this was the location of the first discount / big box store in Lansing. I do not remember the name of store but it was the predecessor of the K-Marts and others we have today. 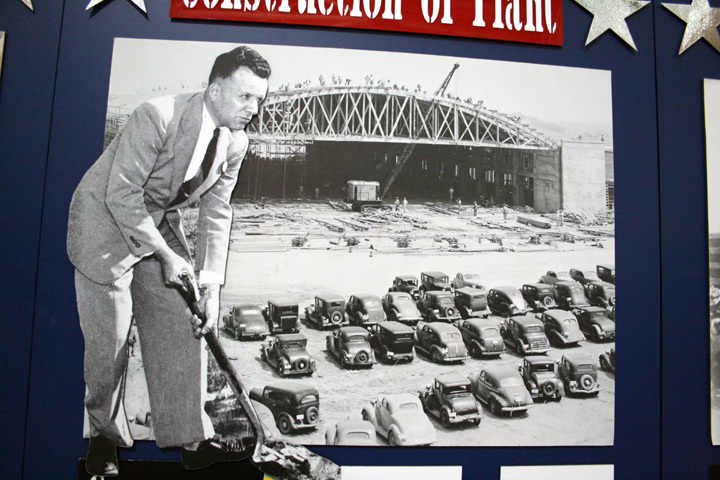 That lasted for a short time and then the plant I believe was occupied by a drop forge, of which we had several in Lansing supporting Oldsmobile. 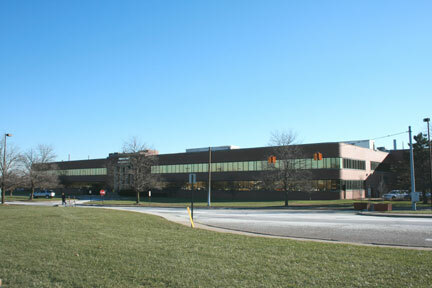 It now is multiple companies in what is called the Mid-Michigan Industrial Center. 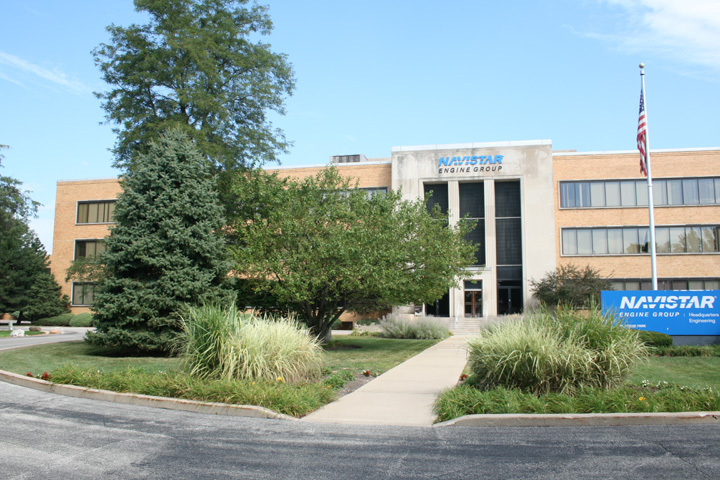 Nash-Kelvinator (South Cedar St. Plant) in Lansing, MI - This is where the original Hamilton-Standard propellers where made before the operation expanded out to the larger facility on Mt. Hope Ave. It was then used for the manufacture of the propeller hubs. After WWII it was purchased and operated by John Bean making fire apparatus until the 1970's. 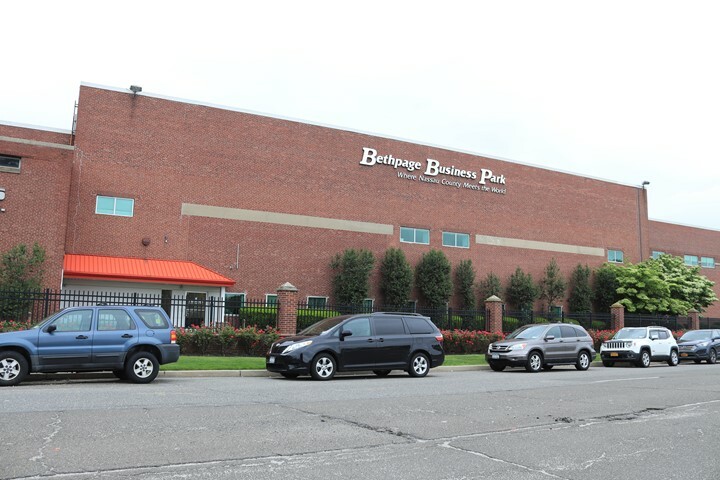 Now it is a home to several different businesses. 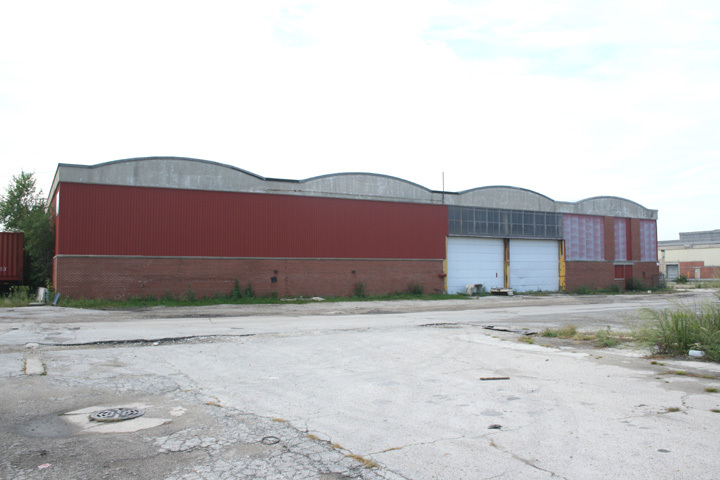 It may also have originally been built by REO which was located on the other side of Cedar Street. 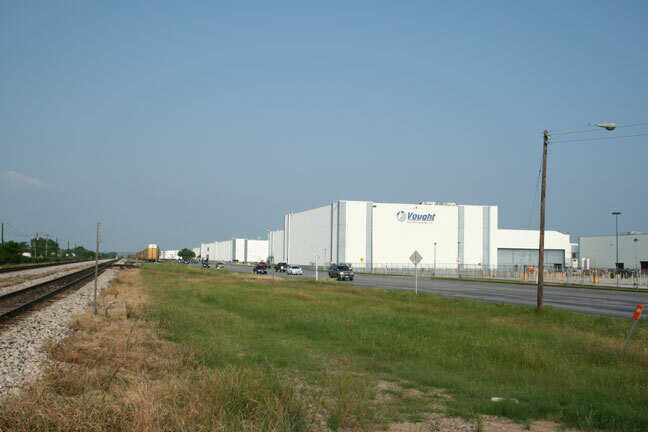 North American in Dallas/Grand Prairie, TX - This government built and owned plant was used by North American starting in 1941 to build AT-6's and later then built P-51's and B-24's under license from Consolidated. 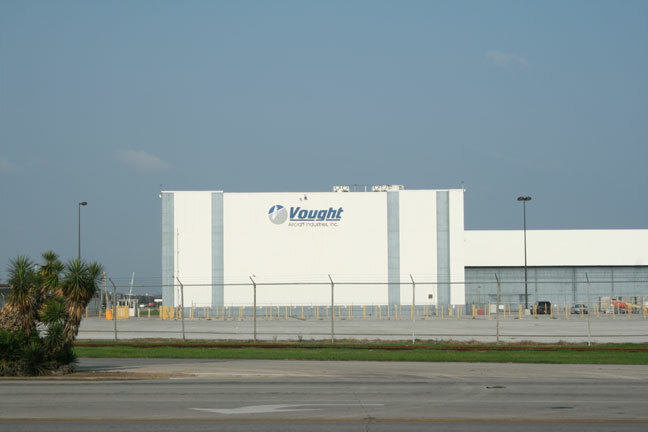 After WWII North American left the facility and Vought moved in from Connecticut. 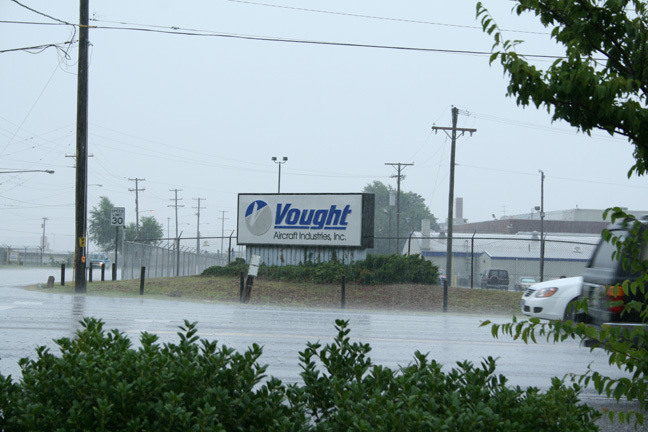 Vought is still located there and it is it's world headquarters. 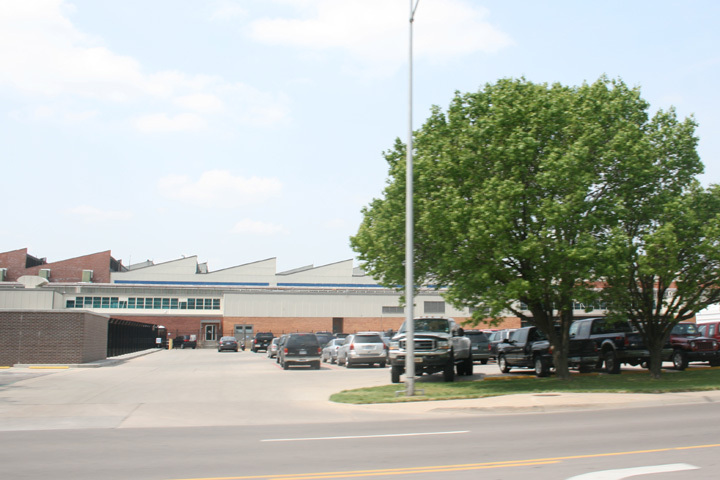 This plant is just one block south of the main street in Grand Prairie and dominates the downtown area. 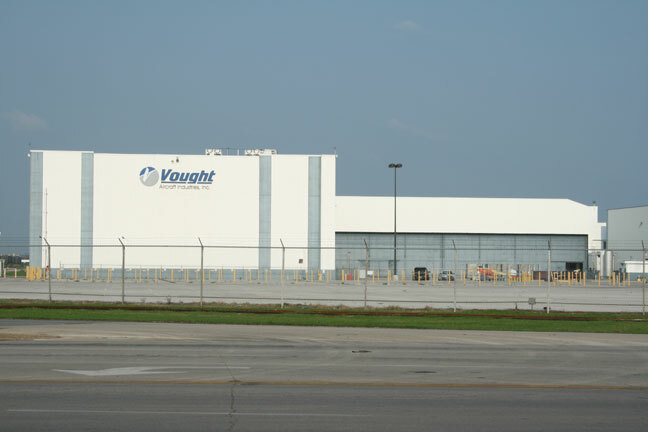 Vought no longer manufactures aircraft here or at its other locations but is a supplier of subassemblies to the remaining aircraft manufacturers. 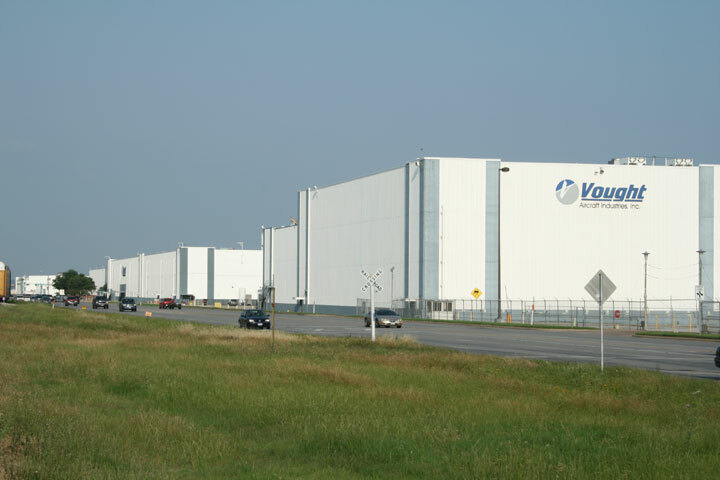 The former NAS Dallas is adjacent and to the east of Vought. 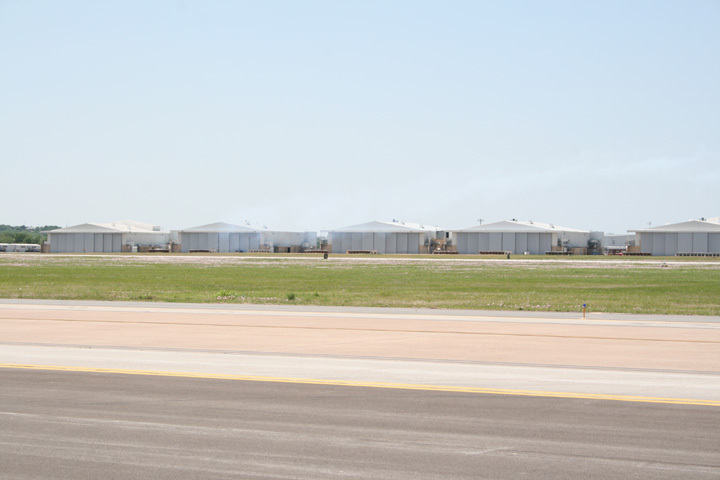 With its closure and move to the former Carswell AFB in FT. Worth there is no longer an active runway at this location. 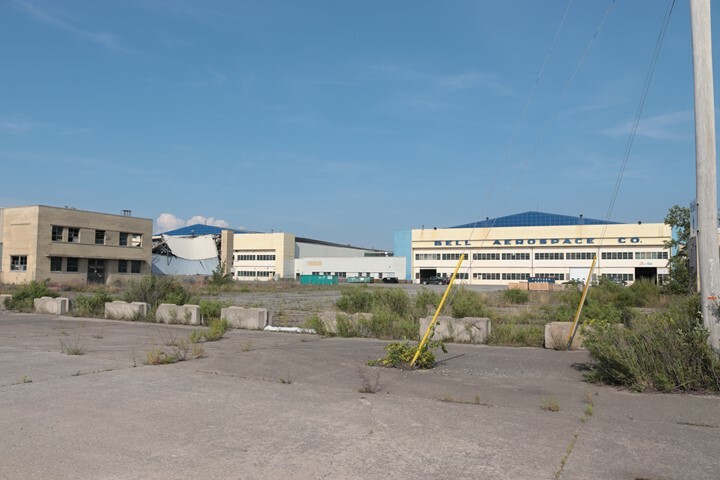 The last flying aircraft built at this plant would have been the A-7 Corsair. 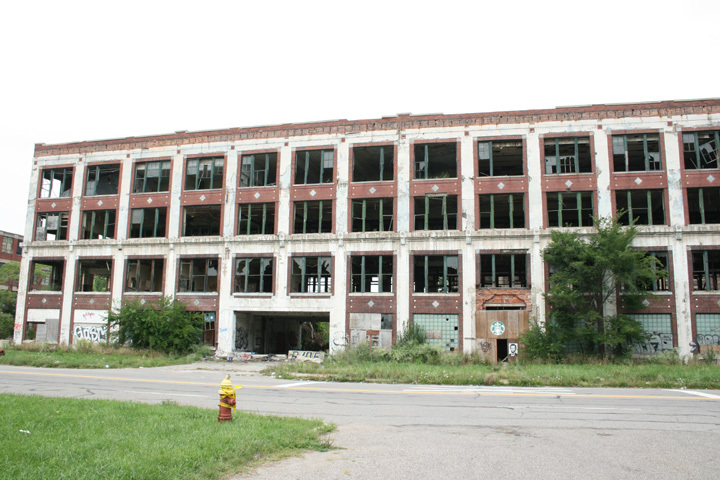 Packard Auto Company in Detroit, MI. 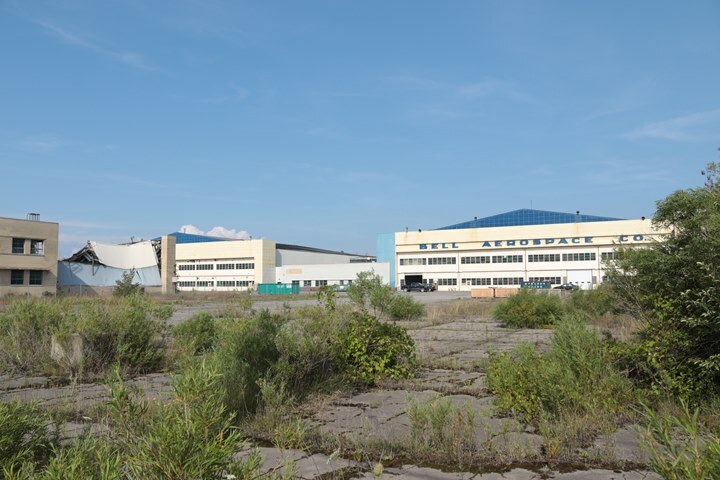 - Manufacturing location of 54,714 Rolls-Royce Packard V-1650 Merlin Engines. 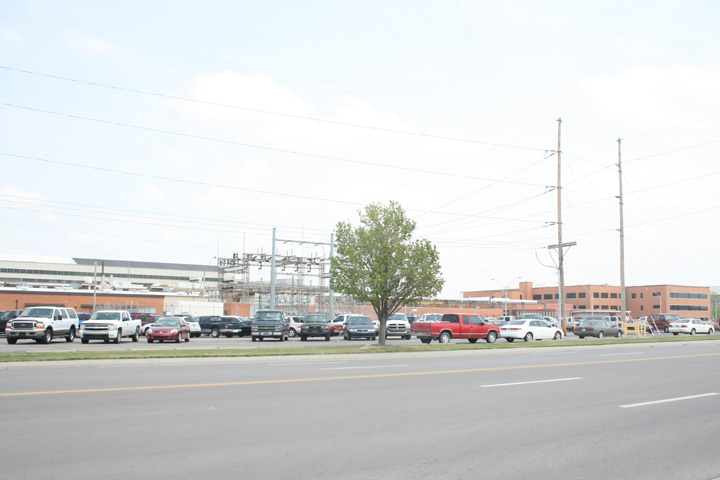 The plant is located at the corner of East Grand Boulevard and Concord Street. 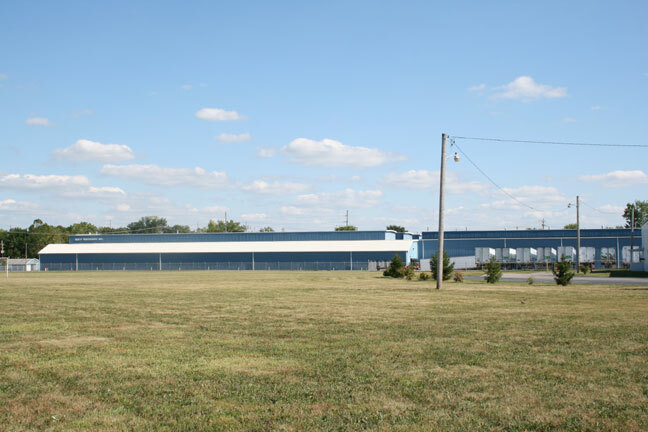 The plant is on both north and south side of East Grand Boulevard and west Concord. 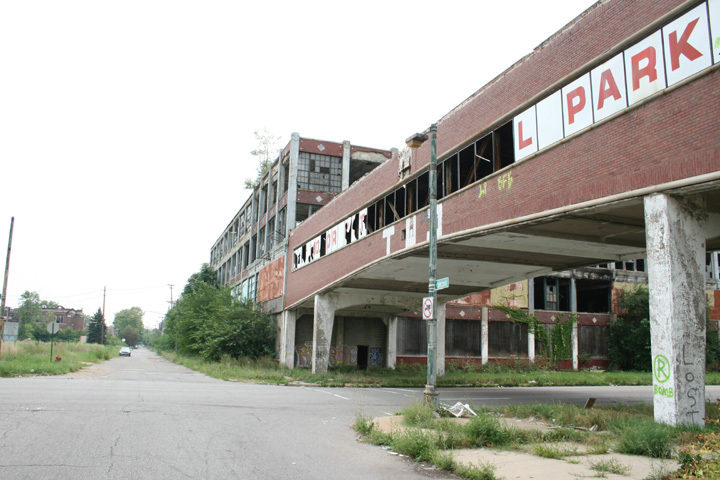 Unfortunately the facility is very dilapidated and is in a neighborhood similar to those seen in the movie Gran Torino. 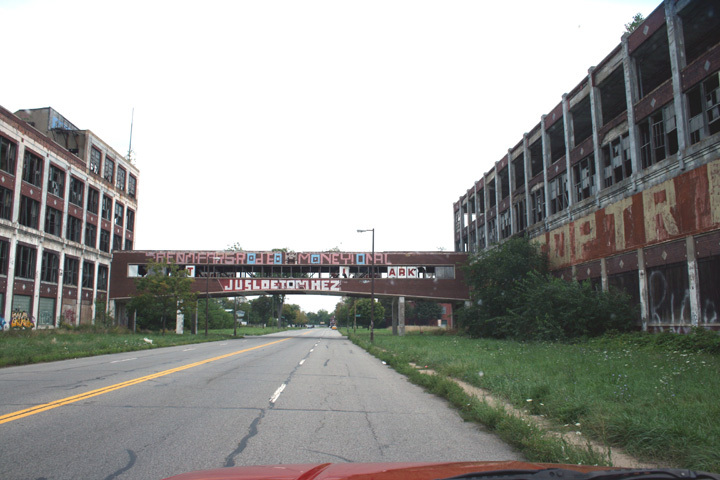 Packard went bankrupt in 1954. Apparently no one has the funding to raze the buildings. 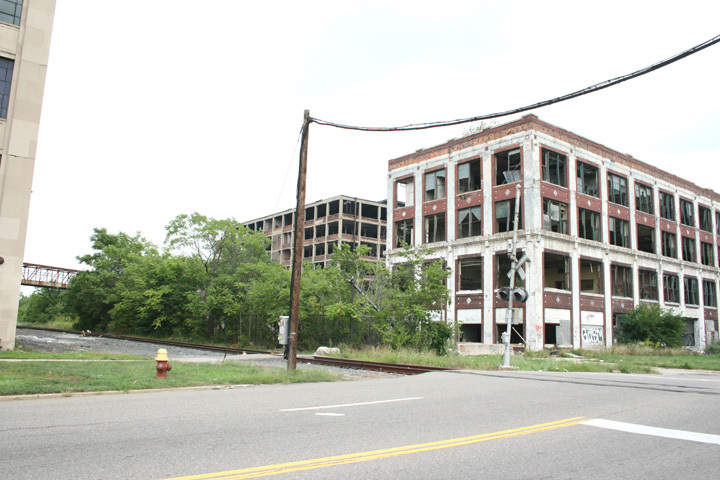 It looks like various businesses and enterprises have utilized the structure since Packard went out of business. There do not appear to be any using it now. 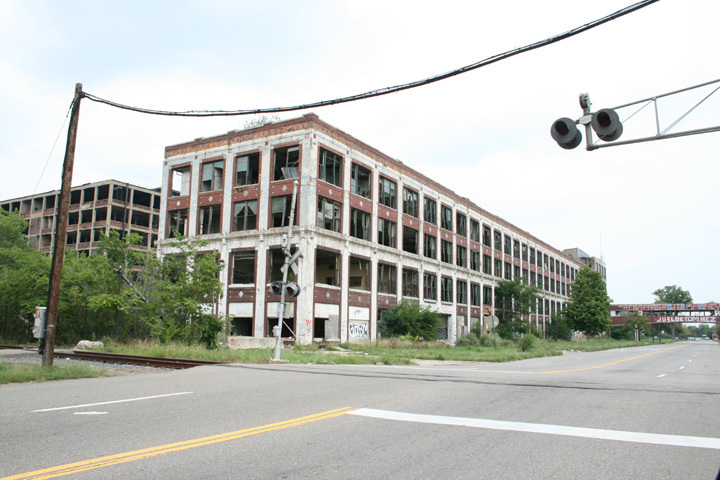 From an architectural and historic perspective, this is an important structure as it was designed by Albert Kahn, a prominent industrial architect that designed many factories, including several of the WWII aircraft plants, until his death in 1942. 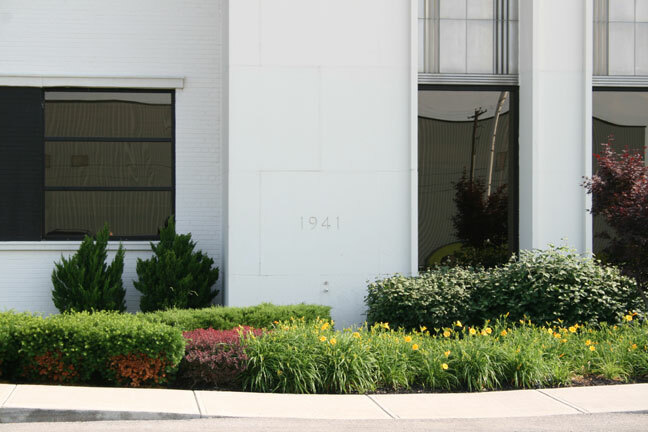 This plant was built in 1907 and the design by Kahn introduced the concept of replacing wood walls with reinforced concrete that allowed more open space for manufacturing. Many of his designs were used in Detroit and he is known as the "Architect of Detroit". 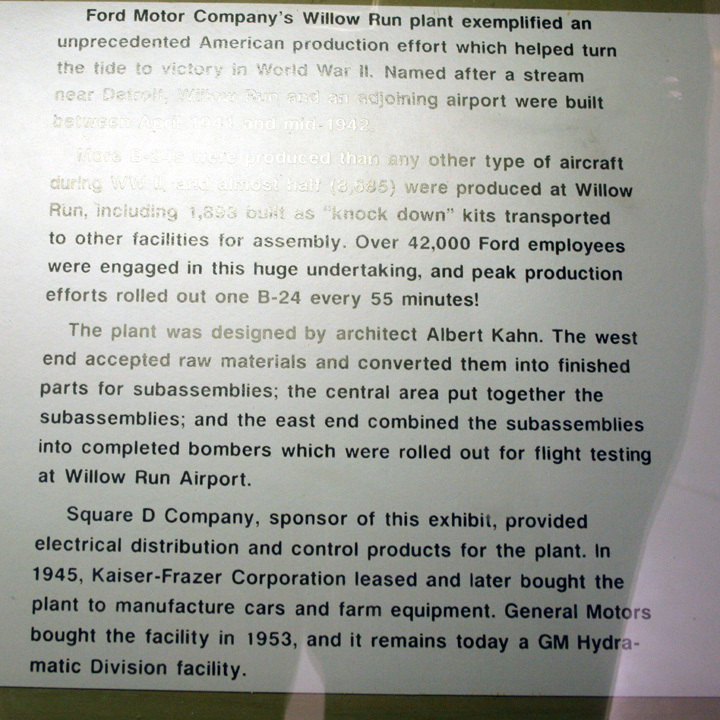 After designing this plant some of his other work in Detroit included the Ford Highland Park Auto Assembly Plant, the massive Ford River Rouge Complex, the Warren Tank Arsenal, and the Ford (Now GM) Willow Run B-24 Plant. 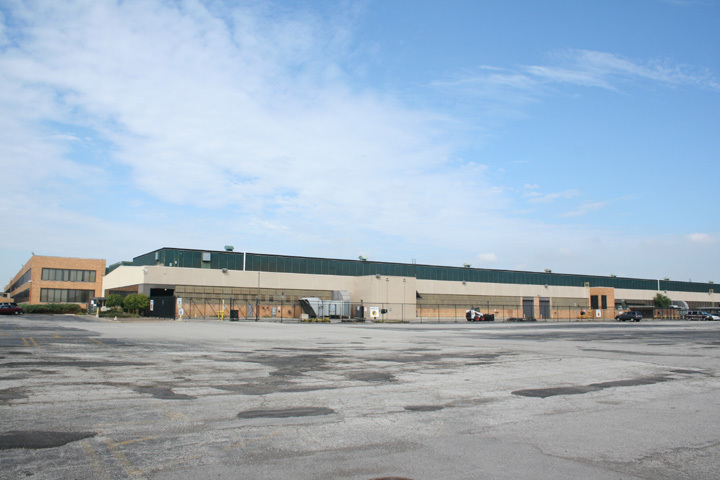 This is the looking east at the west end of the complex on the south side of East Grand Blvd. 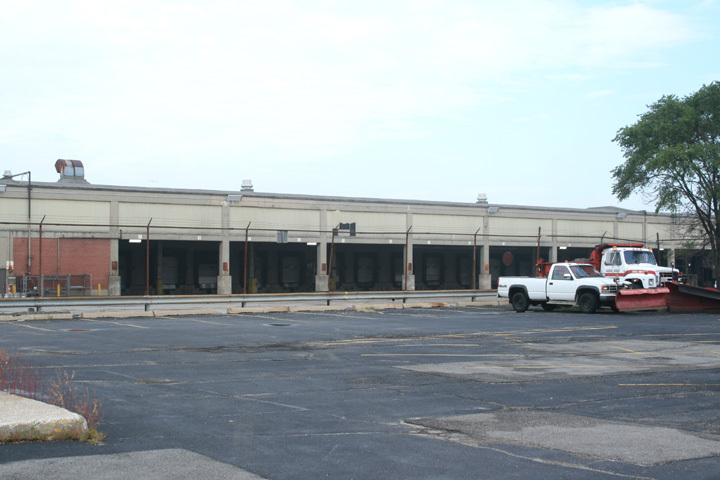 Looking east at the structure on the north side of East Grand Blvd. The overpass in the right corner is just short of Concord St. and connects the north and south buildings. So along this axis the plant is about 1.5 city blocks long. 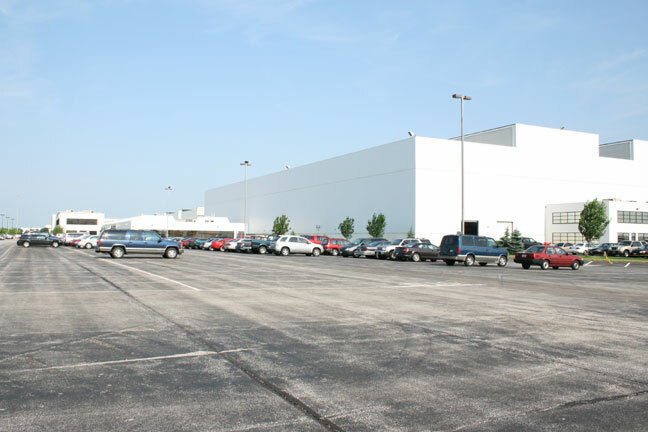 Looking a little more to the north in this photo shows another building that looks to be six stories tall. 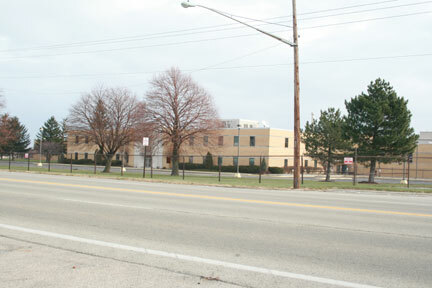 The top of this building can be seen from I-94. Looking north at the west end of the north building. Looking east a the cross over on East Grand Blvd. Looking south on Concord St. from the most northerly section of this wing. 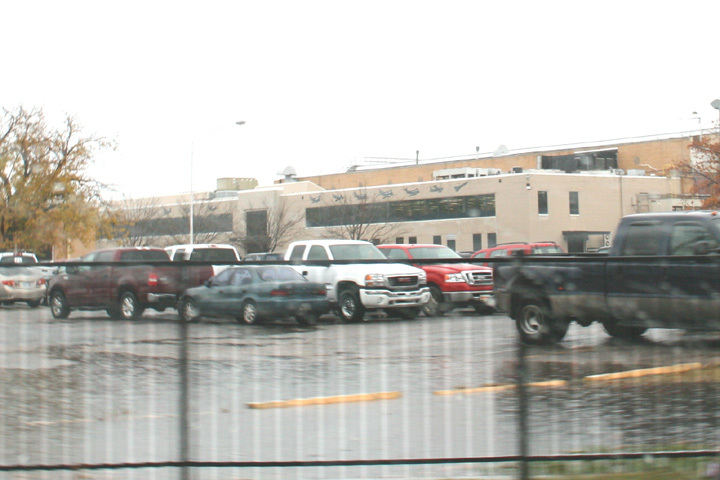 Note that a newer than original construction was added to the north end of the plant. The doors on the right were all locked and may contain living quarters or storage. From the evidence in the area they are currently being used for something. This section is about 4 city blocks long. A little further south. Note that the roof is collapsing on some of this. The corner of East Grand Blvd looking south down Concord. The cross over looks wide enough to have been used to transfer partially assembled vehicles from on building to another along with forklift and shop truck traffic. 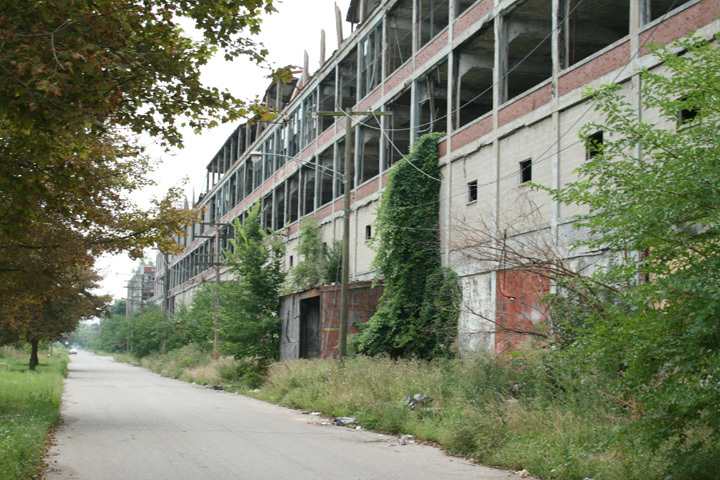 Before and after WWII this plant was used for the manufacture and assembly of Packard automobiles. Looking west down East Grand Blvd. 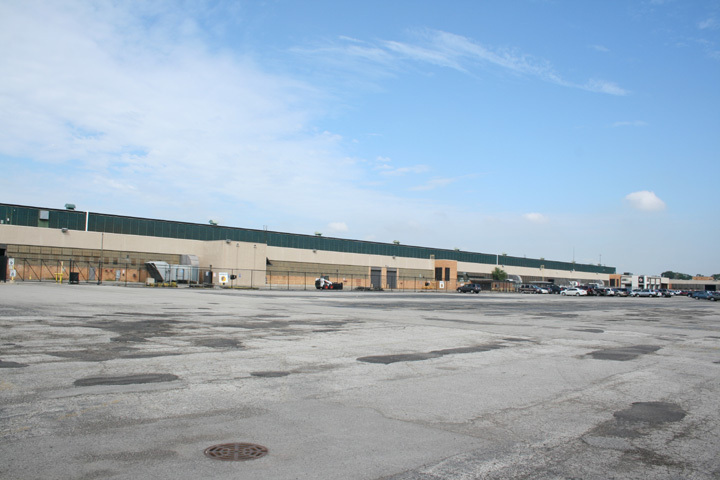 Looking SW from East Grand Blvd from the east side of the complex. 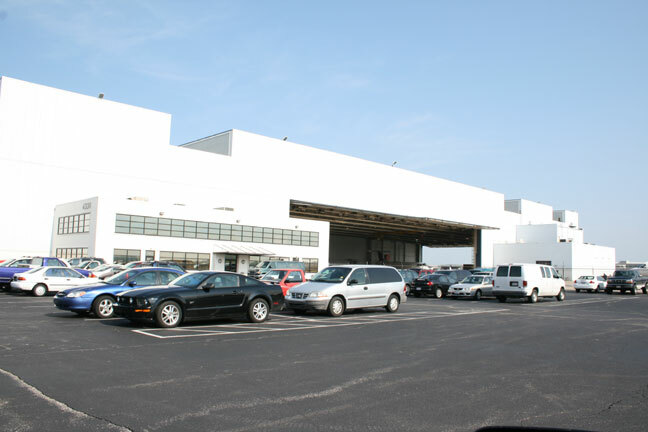 Republic Aircraft facility in Evansville, IN - After WWII International Harvester used this facility until 1955 when Whirlpool took ownership. 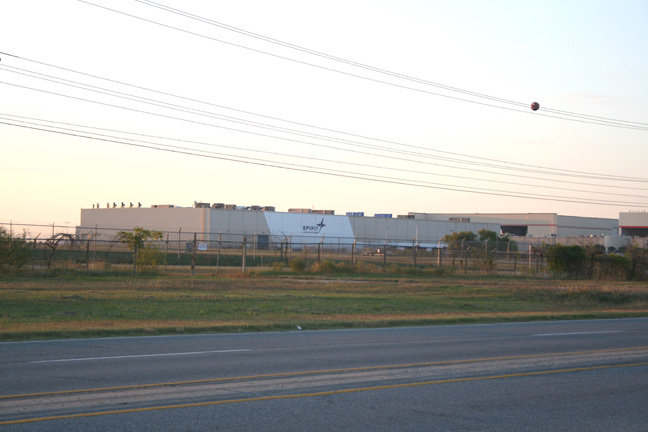 In 2010 Whirlpool closed the facility for production and moved the operation and jobs to Mexico. When I was here in April 2011 there were still a few persons working in the office area. 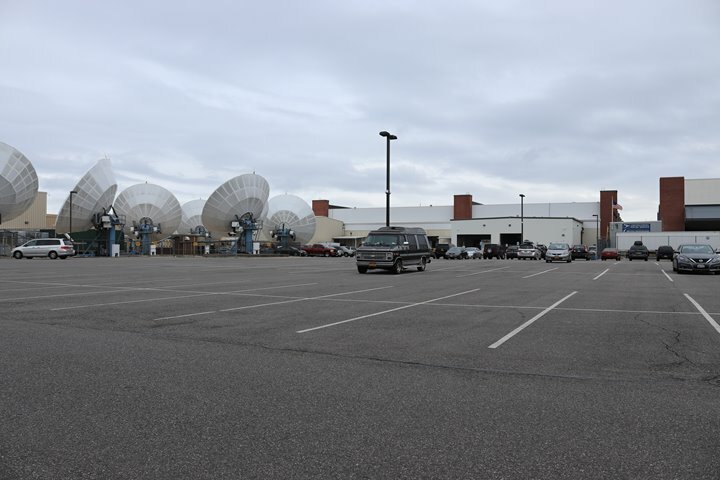 Looking northeast from the deserted parking lot. 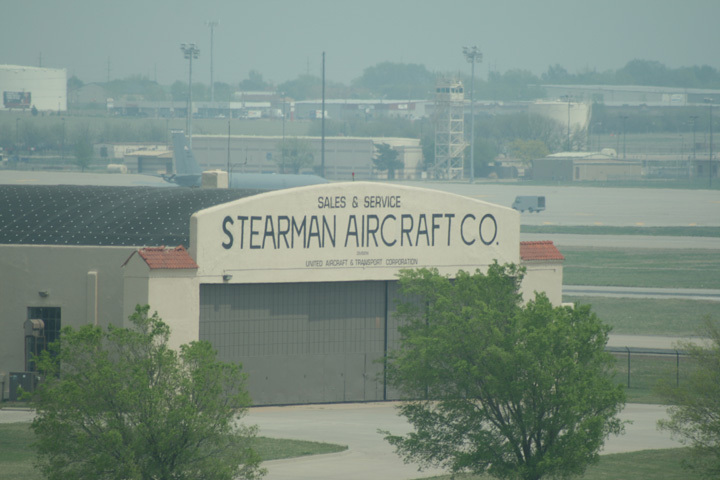 Stearman Aircraft facility in Wichita, KS. 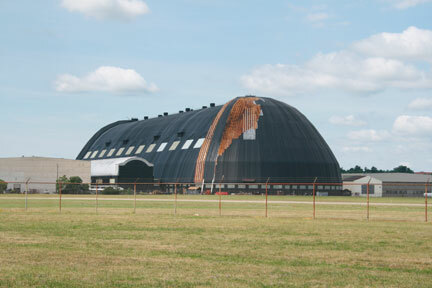 - The hangar that was the Lloyd Stearman initial production facility. 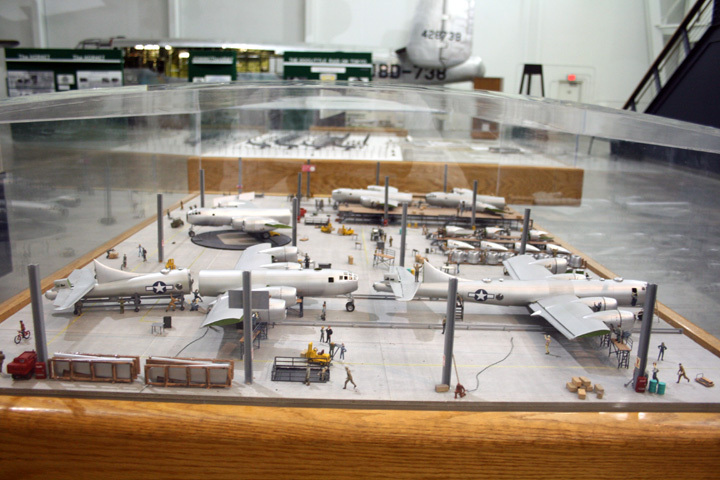 It is now located and preserved on the premises of the Kansas Air National Guard Base. 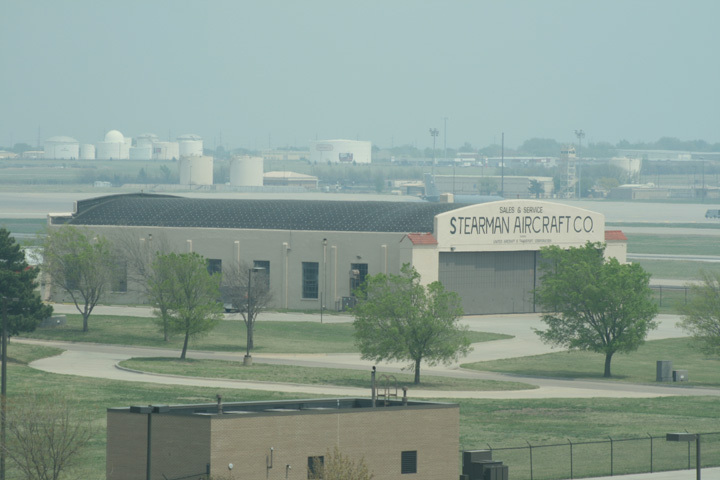 These photos were taken from the control tower of the old Wichita, KS airport terminal facing north east and the tower has tinted windows so the photos have a green tint. 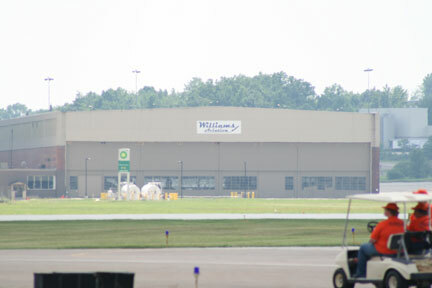 In the background across the runway is McConnell ARB. Below Stearman Aircraft it reads "Division of United Aircraft and Transport Corporation". 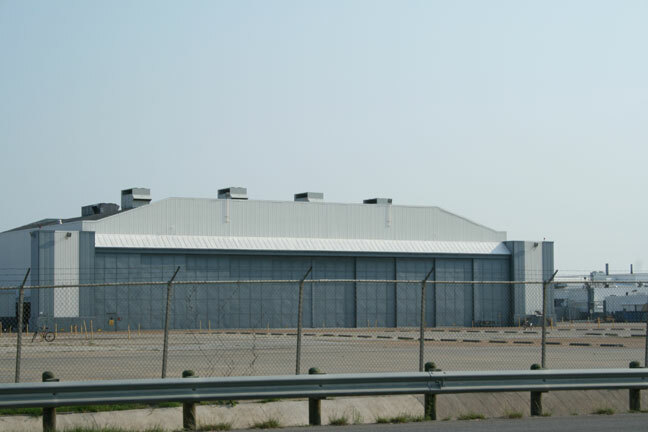 Waco Aircraft facility in Troy, OH - The plant is still there, east of I-75 at the OH State Road 55 interchange on Archer Drive. This is the Waco Plant during WWII. 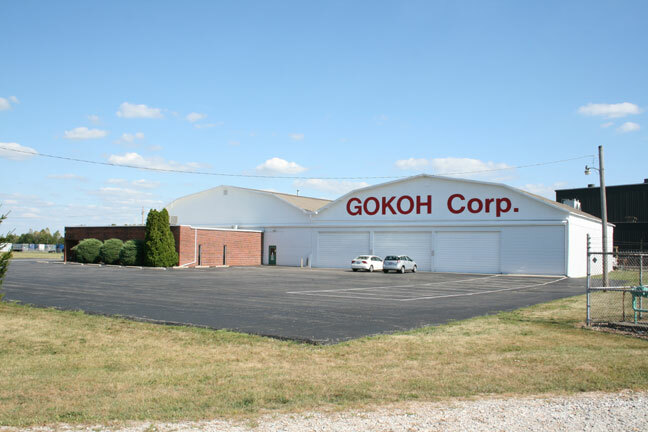 The long building in the upper left is now Waco Warehouse, Inc., the dual hangars center left are now Gokoh, and the center section and the one story in front is now Goodrich. This is a photo of a photo that is in the Waco Museum. 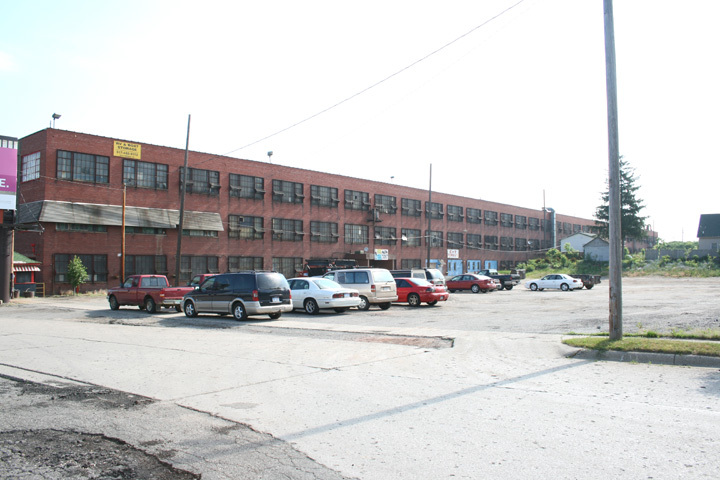 Waco Warehouse, Inc. in September of 2008. 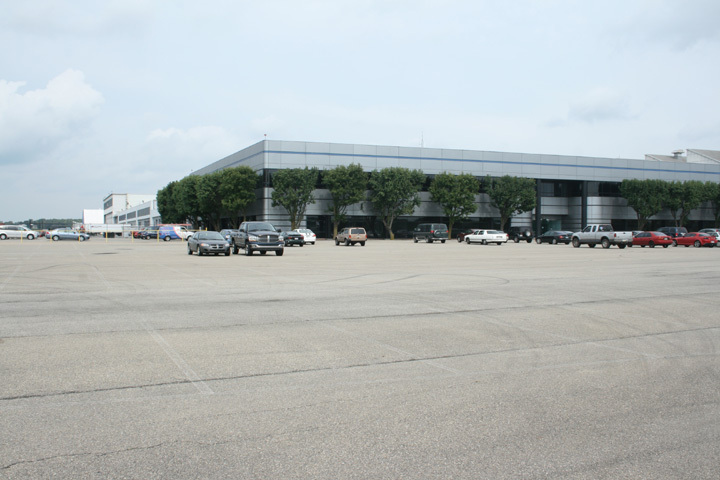 The dual hangars today. 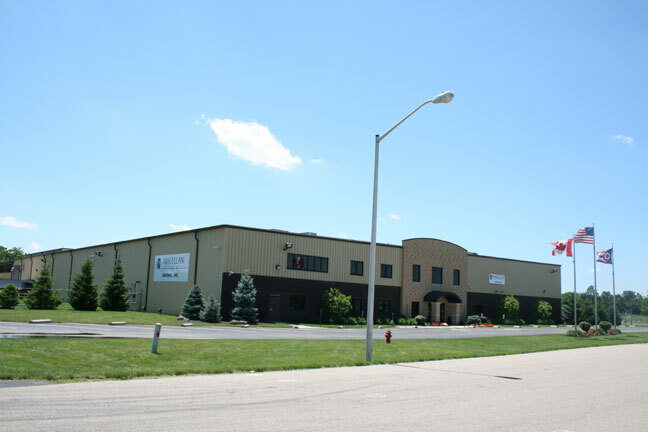 This is an industrial wholesale supply company. 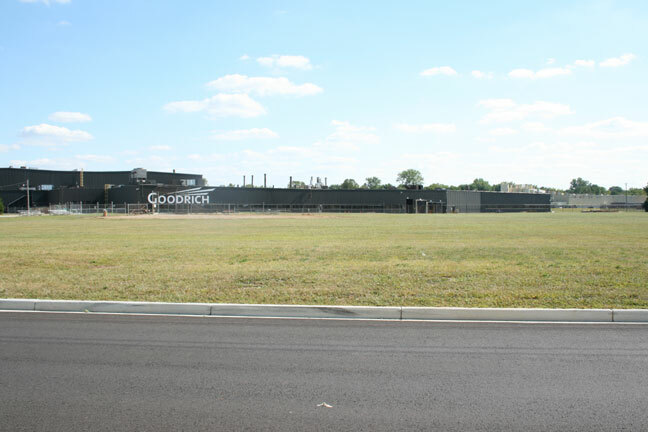 The Goodrich plant, which today makes aviation brake systems, including those for the Space Shuttle.